Browsing articles tagged with " Acupuncture"
Jun Xu, M.D. Lic. Acup., Hong Su, C.M.D., Lic. Acup. Thomas W. is a 65-year-old man who woke up one morning with neck pain that appeared seemingly out of nowhere. He told his doctor the pain was extremely severe: a shooting pain that traveled downwards from his stiff neck to his shoulder blade. He was unable to move his neck forward or backward, and had trouble turning it from side to side. His condition made it dangerous for him to drive as he could not check for cars coming up beside him, and could not change lanes. The pain was constant, sometimes dull, sometimes sharp, but with no associated burning sensation, numbness or tingling in his arms. Occasionally, the pain radiated up to his scalp. His primary care physician referred him to an orthopedic doctor. 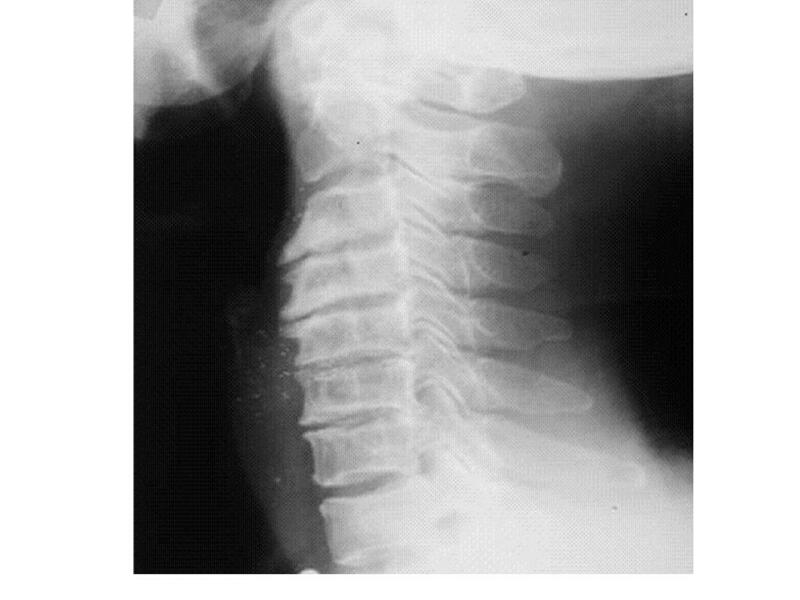 This doctor ordered an X-ray, which showed that Thomas had cervical spondylosis. He was prescribed physical therapy as his sole treatment. He underwent physical therapy three times a week for five weeks, which alleviated the stiffness to some degree, but did nothing for the pain. Thomas then came to me for evaluation and treatment. Cervical spondylosis is a degenerative change that affects the spinal process, causing degeneration in the discs and joints between the vertebrae, i.e. arthritis in the neck. It usually affects people over the age of 40; men are more prone to cervical spondylosis than women. When the vertebral body and disc, as well as the different ligaments along the cervical spine, go through degenerative change, the patient gradually begins to experience neck stiffness. Those affected usually try to adjust their own neck functions and flexibility to the stiffness; however, at some point they will feel severe pain because their bodies can no longer accommodate the changes. The severity of symptoms depends on the location of the degeneration. If the compression affects the discs and ligaments, the patient will feel stiffness and have a limited range of motion, with difficulty turning the head backward and forward, and difficulty looking over his/her shoulder. If the cervical nerve roots are compressed, inflammation and impingement of the nerve roots may result. The patient may feel neck pain radiating to the shoulder, arm and hands, associated with numbness, weakness, headaches, and urinary and bowel incontinency. Cervical collars: to stabilize the neck, and prevent additional neck instability, which might lead to paralysis of the legs and/or arms, a doctor will usually prescribe a soft cervical collar. If a soft collar is not sufficient, the doctor may try a more rigid brace for the neck; however, these collars will restrict the patient’s range of movement of the neck and may, in the long run, exasperate the patient’s stiffness and pain further. Thus, this method is not very effective. Physical therapy: involves the use of a heating pad, electrical stimulation, ultrasound technology, massages, and cervical stretches. These treatments can often be very helpful to the patient. The conservative measure of a cervical collar does not work. There is significant neurological damage, such as difficulty in raising the arm, weakness, or bladder problems. There is a compression of the spinal cord. Laminectomy: a spine operation to remove the portion of the vertebral bone called the lamina, which will release the pressure to the pinched nerves. Discectomy: a surgical removal of the central portion of an intervertebral disc, the nucleus pulposus, which causes the pain by stressing the spinal cord or radiating nerves. Thomas underwent physical therapy and used a cervical collar. Though he felt some improvement, he was not cured. At this point, he consulted me for further treatment. I treated Thomas with the following traditional Chinese medicine method. First, I applied a heating pad to the patient’s neck for 15 minutes. Then, I inserted the acupuncture needles at the: Hua Tuo Jia Ji points at the C4, C5, C6, and C7; Arshi points; Du 14 Da Zhui; LI 15 Jian Yu, LI 11 Qu Chi, SJ 5 Wai Guang, and LI 4 He Gu. 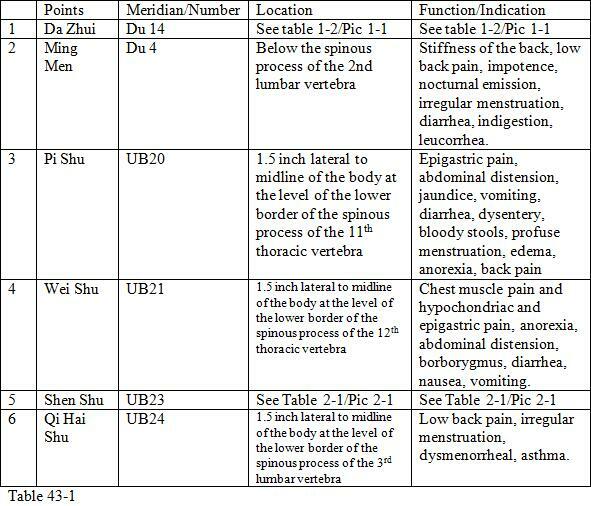 I also used the small intestine meridian points, such as SI 3 Hou Xi, SI 5 Yang Gu, SI 8 Xiao Hai, SI 12 Bing Feng, and SI 11 Tian Zong to balance the energy of the entire upper extremity region. 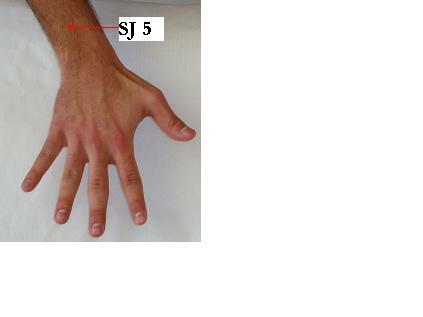 8 Hou Xi SI 3 When a loose fist is made, the point is on the ulnar side, proximal to the 5th metacarjpophalangeal joint, at the end of the transverse crease and the junction of the red and white skin Pain and rigidity of the neck, tinnitus, deafness, sore throat, mania, malaria, acute lumbar sprain, night sweating, febrile diseases, contracture and numbness of the fingers, pain in the shoulder and elbow. The acupuncture was coupled with strong electrical stimulation, after which the patient was treated with ultrasound and massage. After six weeks of treatment, his neck function had improved greatly and he was able to turn his head while driving without difficulty. He therefore avoided surgery, and, while he still experienced minimal pain, the acupuncture alleviated his condition and strengthened the main function of his cervical spine. Acupuncture alone cannot cure cervical spondylosis because degenerative changes of the cervical spine severely affect both ligaments and joints. For people over the age of 40, it is common for calcium to be released from the bones and begin circulating in the blood. This circulated calcium begins to affect the body’s joints, and if it reaches the cervical spine, it will cause cervical spondylosis and degeneration in the surrounding ligaments, discs and joints. After a while, the condition will restrict the neck’s range of motion. Acupuncture may help relieve some of the symptoms, mainly pain, but the physical degeneration cannot be reversed through this method. Since this condition is ongoing, and can lead to difficulty in walking, numbness and tingling sensations in the arms and hands, weakness of the arms, and urinary tract incontinence, the earlier it is treated, the better. These symptoms can quickly worsen, causing permanent loss of nerve function; in this case, surgery will be absolutely necessary. Always apply a heating pad to the patient’s neck for about 15 minutes before inserting the acupuncture needles. The heating pad will improve the energy circulation. 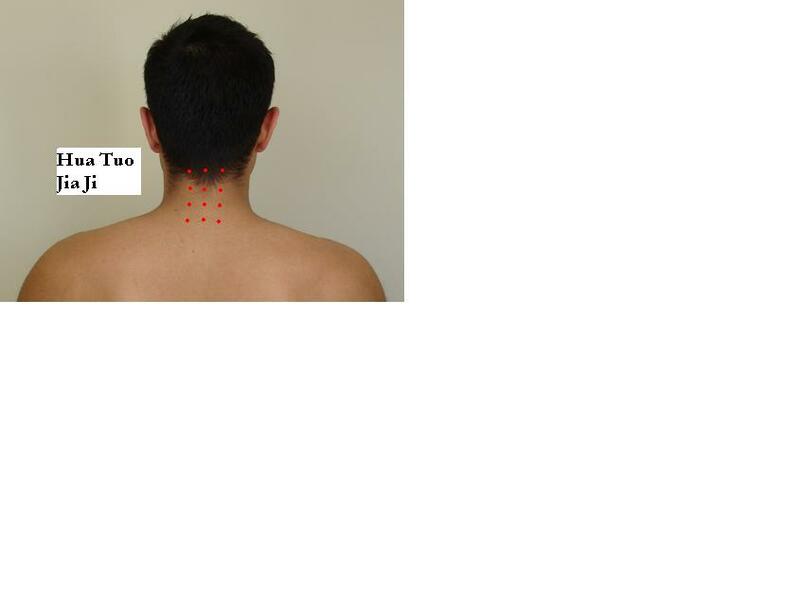 Hua Tuo Jia Ji is a group of excellent acupuncture points; you should always use it when treating patients with neck pain. You may use a heating pad at home to help with the healing. You may adjunct the acupuncture treatment with massages and range of motion exercises for your neck. Jeffrey S. is a 35-year–old man who was involved in a motor vehicle accident from which he sustained a neck injury. He was stopped at a red light when another car rear-ended him. He did not lose consciousness, and though he was aware that his neck had shifted backward, he felt the injury was only minor at the time. When the police officers at the scene of the accident suggested that he go to the hospital for evaluation, he did not feel sufficient pain to warrant this; plus, he had a meeting scheduled. About two weeks later, the initial neck pain had radiated down to his right shoulder, elbow and hand, and he also felt numbness and tingling. The pain occurred on and off, especially during the night. In the mornings when he woke up, his neck felt very stiff; the pain was severe and he could not lift heavy objects. At this point, he visited his primary care physician, who ordered an MRI and X-ray. These tests showed a herniated disc at C5 and C6 but no fracture. The patient was referred for physical therapy and to a neurosurgeon. The neurosurgeon prescribed two months of physical therapy, then a follow-up visit. The patient attended physical therapy three times a week, but after a few weeks, the pain worsened, not only radiating down his right arm, but also between his shoulder blades. In addition, he felt stiff and had difficulty moving his head forward and backward. His neurosurgeon gave Jeffrey a neck collar, which also did not help. The doctor suggested that, since physical therapy had not worked, the patient should consider surgery. Jeffrey did not want surgery. He was a self-employed car dealer and could not afford to take the month off required for surgery and the recovery period. He was subsequently referred to a pain-management physician who gave him epidural injections at C5-C6. These greatly alleviated Jeffrey’s neck pain; however, a month later the pain returned and was much more severe and Jeffrey did not know what to do next. He was referred to me for help and I was able to offer him an alternative treatment. Soft tissue injury: involves the muscles and ligaments. Usually there is no pain radiating down to the shoulder and arm, and no numbness or tingling sensation; however, the patient feels neck pain localized on the cervical spine and posterior shoulder and experiences pain and neck weakness when he/she wakes up each morning. Herniated disc injury/cervical radiculopathy: caused by moderate to severe neck injury. The most common is C5-C6 herniated discs, which impinge the cervical nerves causing the pain to radiate down to the shoulder, arm and sometimes, wrist, making the injured sides feel heavy and weak. 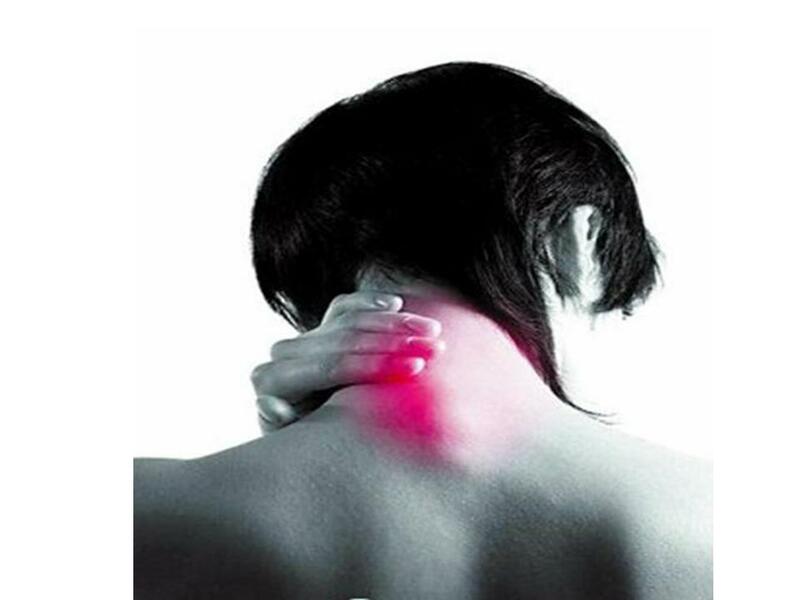 Very often, the patient feels pins, needles and burning sensations (cervical radiculopathy). Neck fractures or dislocations: severe neck injury will cause fractures or dislocations of the neck, which will in turn damage the spinal cord with more severe symptoms similar to the above. Often may cause paralysis. Jeffrey’s injury falls into the second category: cervical radiculopathy with herniated disc. X-ray: most common test. Checks for bone fractures. If the pain is not severe this test usually suffices. MRI: studies the spinal cord and nerve roots. CT scan: allows careful evaluation of the bony structure of the cervical spine. Myelography: dyed liquid is injected into the spinal cord to evaluate it and the nerve roots. EMG (electromyography): evaluates nerve and muscle function. Anti-inflammatory medication: Naproxen, Tylenol, Advil, etc. are administered to decrease neck inflammation. However, these medications usually just mask the pain, and incur many other side effects, such as stomach upset, peptic ulcer, and increased chance of blood clots. They cannot be expected to specifically treat the cause of the cervical herniated disc. Immobilization: most patients only need a soft collar, which gives psychological support to immobilize the neck. In other words, if the patient feels he/she can depend on the collar for some support, the perception of pain is usually decreased to a certain degree. In some cases, a solid cervical orthotic device might be used for unstable fractures of the cervical spine. Physical therapy: heating pads, ultrasound technology, stretching and strengthening exercises coupled with massages and range of motion exercises of the cervical spine. This helps if the patient has soft tissue injury without a severe herniated disc. Epidural injection: the patient is put under a specific, C-arm X-ray machine. Then, a trained physician injects the steroid into the herniated area and nerve root, which decreases the inflammation and pain. This treatment relies on the experience of the physician and the severity of the herniated disc and pinched nerve. If the injury is too severe, epidural injection might not help, especially if the physician cannot inject the steroid into the specific point. Discectomy. The neurosurgeon might cut out only the injured portion of the disc, which will remove the pressure of the herniated disc from the nerve root. This may cause the symptoms to decrease or disappear. Sometimes, the entire herniated disc will disappear because of the degenerative changes in the disc tissue. Laminoctomy. Sometimes the disc degenerates or the nerve root impingement is very severe. In these cases, removing a part of the herniated disc through discectomy is not sufficient to relieve the pain. Thus, the surgeon may cut off a piece of the bone to open the nerve root outlet. Traction: recommended by doctors when the patient wants to avoid surgery. This treatment pulls and slightly separates the vertebrae of the neck so that the herniated disc might return to its original place, thus relieving the pain. The neck position is extremely important in this course of treatment, The neck should not be hyperextended and pressure must be tested before flexing the neck as this could cause further damage to the cervical vertebrae. Jeffrey underwent most of the treatments listed above, without experiencing significant improvements. Before undergoing surgery, he decided to consult me. 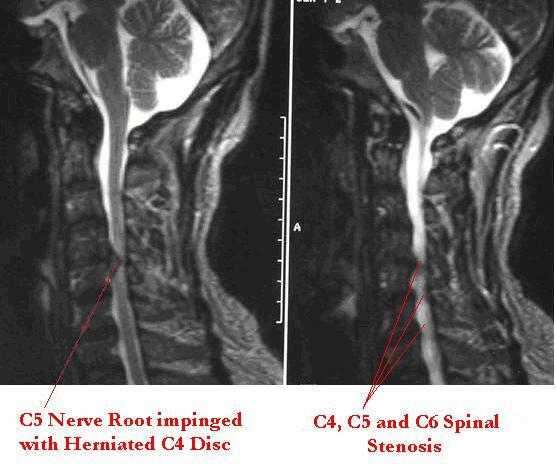 After a thorough physical examination, I concluded that the patient had the symptoms of right C5 and C6 nerve distribution and the herniated disc was impinged at C5-C6 nerve roots. 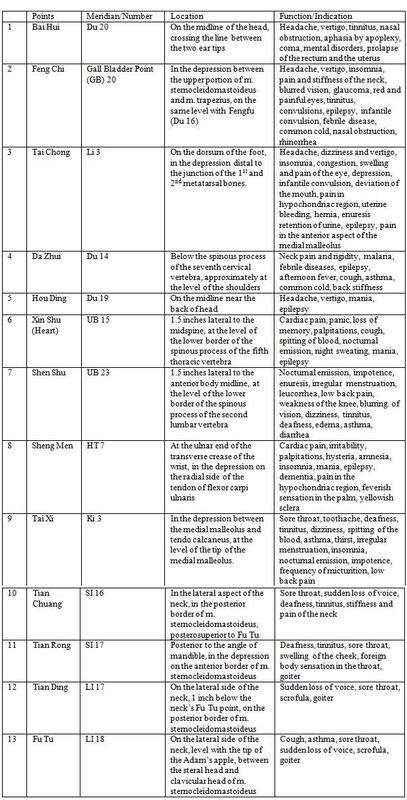 The following table is a description for the pathophysiology of the cervical radiculopathy, i.e. 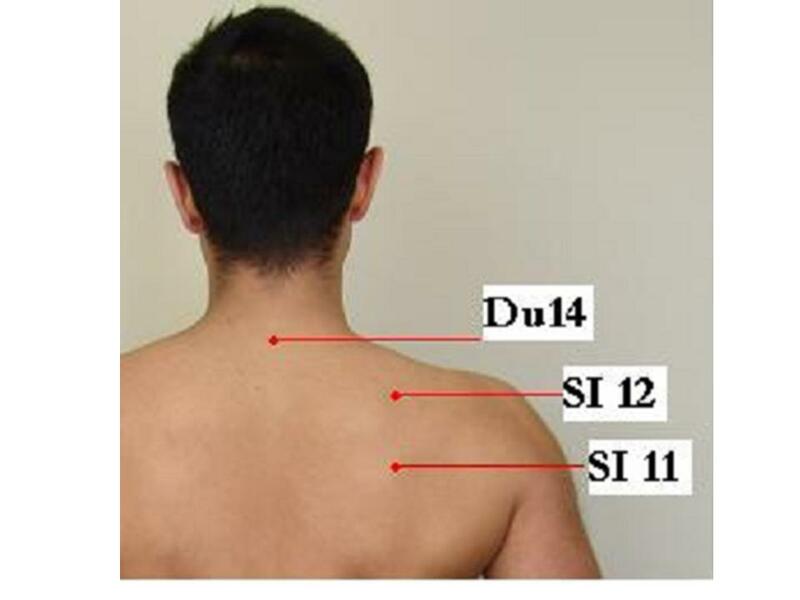 the neck nerve root impingement at different root levels. From the above films, it is evident that there was a herniated disc at C4, which impinged the C5 nerve root and caused the symptoms Jeffrey complained of. I employed acupuncture to treat the injury, following the cervical spine from C5-C6 up into the lateral portions of the shoulder, upper arm and forearm. Hua Tuo Jia Ji points are a set of specially designed points used to treat disc diseases. By palpation, you should feel the herniated disc spinal process, then insert the needles (about 0.5 inches deep) into the herniated disc, and the discs one level above and one level below the level of the herniated disc. Then, insert needles 0.5 inches from the lateral sides of each of the three initial needles. Thus, a total of 9 needles are inserted into the herniated disc and adjacent area. For this particular case, I also extended this Hua Tuo Jia Ji to C4 and C7 levels. 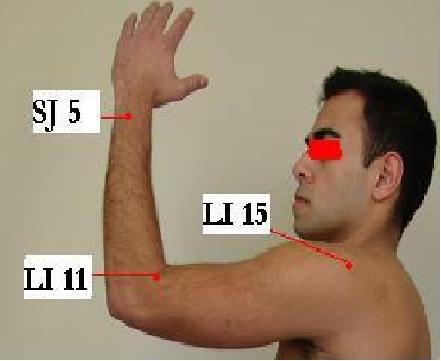 For the other parts of the body, I selected LI 15 Jian Yu, LI 11 Qu Chi, SJ 5 Wai Guan, and LI 4 He Gu. The C5-C6 nerves connect to the lateral shoulder and the lateral upper arm; all the above acupuncture points follow these nerve roots locally. The local acupuncture points will increase blood flow in the area, wash away inflammatory factors, and decrease the muscle spasms and inflammation. 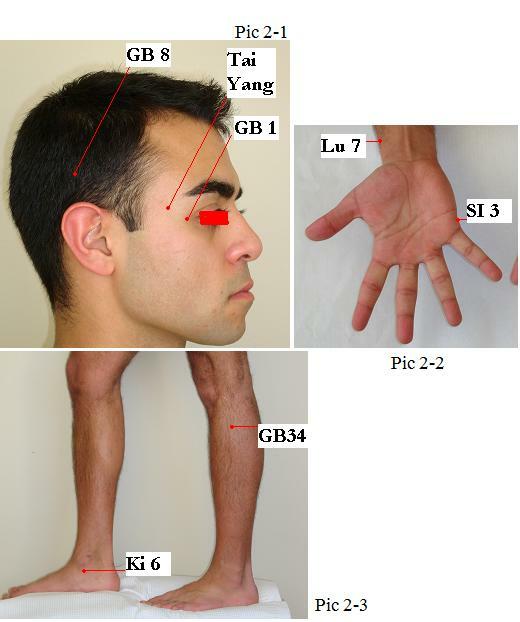 Distal acupuncture points such as the bilateral Tai Chong and He Gu should also be selected. These largely increase the amounts of endorphins secreted in the brain, which help to decrease pain. 1 Hua Tuo Jia Ji ExperiencedPoints Along the spine, use the most painful vertebral spinal as the midpoint, then locate the upper and lower spinal process and points located 0.5 inches on either side. You may choose two spinal processes as the starting points. See Pic 4-1 Specifically treat for local neck and low back pain, and pain along the spine. 4 Qu Chi LI 11 Flex the elbow. 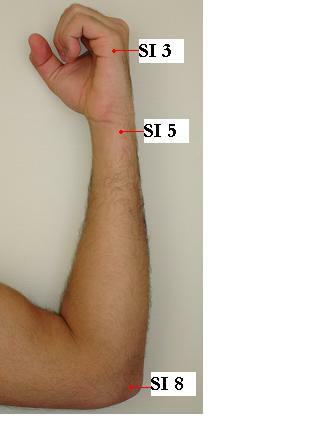 The point is in the depression of the lateral end of the transverse cubital crease. Sore throat, toothache, redness and pain of the eye, scrofula, urticaria, motor impairment of the upperextremities, abdominal pain, vomiting, diarrhea, febrile disease. 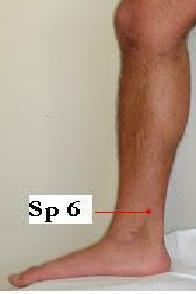 5 San Yin Jiao Sp 6 3 inches directly above the tip of the medial malleolus, on the posterior border of the medial aspect of the tibia. Abdominal pain and distention, borborygmus, diarrhea, dysmonorrhea, uterine bleeding, morbid leucorrhea, prolapse of the uterus, delayed laboour, nocturnal emission, impotence, enuresis, dysuria, edema, hernia, pain in the external genitalia, muscular atrophy, motor impairment, paralysis and pain of the lower extremities, headache, dizziness and vertigo, insomnia. Pic 4-3 The patient underwent my treatment for a total of 20 visits (twice a week for ten weeks). Gradually, his pain decreased, the neck spasms and right-side arm weakness decreased, and the patient felt a large overall improvement. I have found that the most efficacious treatment involves a combination of acupuncture, heating pads, massage and physical therapy. I do not recommend that a patient undergo surgery immediately. Studies have shown that surgery for this condition may show a marked improvement for about six months; however, after this period, the pain usually returns. After two years, the patients with or without surgery may have the same level of pain (patients who did not undergo surgery were instead treated with acupuncture, physical therapy, massage and chiropractic therapy). Therefore, I recommend that patients explore other options before jumping into surgery. A clear diagnosis is the most important factor in these cases. 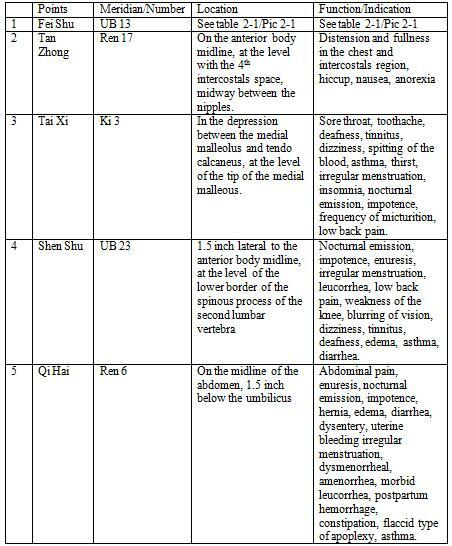 For any acupuncturist to treat neck pain, he/she must first understand the mechanism of the pain. If the pain is moderate, acupuncture treatment alone may help. If it is more severe, it is important to refer the patient to a western doctor for evaluation. If there is a fracture, the patient could become paralyzed and it is therefore absolutely necessary to first employ MRIs, X-rays, and CT scans to rule out skeletal instabilities. February 14 was the first day of the Chinese New Year. This year is the year of the tiger. In Chinese tradition, the year of the tiger will usually make you look forward to the bright future and bring you an exciting fortune. Therefore, we wish you a Happy Chinese New Year of Tiger! This month’s case discussion is about Trigeminal Neuralgia, which is common to middle and elderly aged people. We hope you may learn something from this case discussion. Jun Xu, M.D. and Hong Su, C.M.D. Sharon, a 65-year-old woman who suffered from a toothache on the right side of her mouth for a month, finally consulted her dentist who found two loose teeth in the back, right side of the mouth. The patient loves sweets, which may have caused the problem, but the pain was so severe that she was unable to sleep. The pain occurred proximally and started when Sharon tried to brush his teeth; the pain was so severe that she could not bear to touch the teeth or the right side of her face and jaw. Even air currents could trigger the pain. She had difficulty eating, talking, and brushing her teeth. The shooting pain felt like electrical shocks and burning, and, at times, was unbearable. It attacked the right side of the jaw and face and lasted for hours. The patient intentionally tried not to use the right side of teeth in order to avoid triggering an episode of pain. Finally, the dentist decided to pull out the two lower teeth. At this point, the patient felt immediate swelling on the right side of her face and, after a week, the pain became worse. The doctor also prescribed narcotics to ease the pain. There was no improvement after the tooth extraction and the patient still could not touch the right side of his face. Upon examining him, I discovered that although the pain did not extend to the right side of her eye, the right cheek and jaw were tender and the pain was described as intolerable by the patient. She felt it was incapacitating her to the extent that she was losing normal function and had dropped ten pounds. She also experienced fatigue and was unable to sleep. Sharon is suffering from trigeminal neuralgia. The trigeminal nerve carries sensation from the face to the brain. Many studies indicate that when the superior cerebellar artery compresses this nerve, the nerves protecting the myelin sheath are injured, causing erratic and hyperactive function of the nerve. This can lead to pain at the slightest stimulation of any area served by the nerve, as well hindering of the nerve’s ability to shut down pain signals when the stimulation ends. The trigeminal nerve is the fifth cranial nerve, which registers sensory data such as pressure and temperature and measures pain originating from the face above the jaw line. The trigeminal nerve has three branches, one going to the eye, the second to the mouth, and the third to the jaw. In Sharon’s case, two of these three trigeminal branches (mouth and jaw) were affected. This condition is usually found in males and females at the ratio of 2:3, and most trigeminal neuralgia cases are idiopathic and typically occur in the sixth decade of life, although they may occur at any age. The symptomatic or secondary trigeminal neuralgia may occur in younger patients. The patient’s history is the most important factor in the diagnosis of trigeminal nerve neuralgia. The nature of the pain may be brief and proximal, but it may also occur in multiple attacks and may be stabbing or shock-like or extremely severe. It is usually distributed in one or more branches of the trigeminal nerve and is usually maxillary or mandibular and unilateral. This pain typically lasts from a few seconds to one to two minutes and will typically occur for a few months each year. Medications. The most typical medications prescribed by doctors and dentists are anticonvulsants such as carbamazepine, oxcababazepine, phyntoin or gabapentin. Generally, these are the most effective for pain relief, and can be adjuncted with muscle relaxants such as baclofen. Some opiates can also be effective such as OxyContin or Duragesic in patch form, for decreasing pain in the jaw and face, as well as low doses of antidepressants such as amitriptyline. Surgery. Surgery may relieve pressure on the nerve or selectively truncate the nerve by disrupting the pain signals from getting through to the brain. It is usually 90% successful if done by an experienced surgeon. The most specific kind of surgery is microvascular decompression. Stereotactic radiation therapy. A surgeon uses a gamma knife or linear accelerator (a form of radiation therapy) such as the Novalis Cyberknife. The therapy penetrates the skin and targets the selective nerve root and disrupts the pain signal transmissions. According to Traditional Chinese Medicine, the stomach meridian is distributed around the eye, the jaw, and the teeth. Therefore, if the stomach meridian is blocked, the external wind and heat will be mutually mixed, and the wind flame will invade the stomach meridian and cause severe pain along the meridian (i.e. along the face, teeth, and eye). 1. Ophthalmic nerve branch. This is the top branch of the trigeminal nerve. 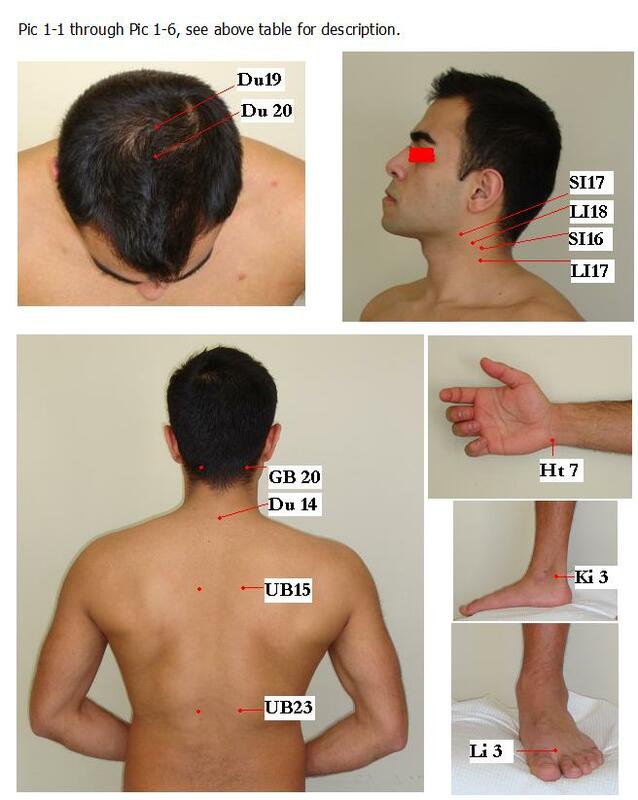 Acupuncture points include the EX-HN4 Yu Yao, GB 1 Tong Zi Liao, SJ 23 Si Zu Kong, EX-HN5 Tai Yang and UB1 Jing Ming. The needles should be inserted in 0.3 to 0.5 inches deep. The patient should feel a stimulation similar to an electric shock. Continue to twist the needles three to five times, and then put the needles on the electrical stimulating machine for 30 minutes. 2. Maxillary nerve branch. Use the St 2 Si Bai and St 1 Chen Qi points and the manipulation described above. 3. Mandibular nerve branch. Use the St 7 Xia Guan, Ren24 Cheng Jiang and St 4 Di Chang points and the manipulation described above. In addition, choose some body points such as GB40 Qiu Xu, Li v 5 Li Gou, LI 4 He Gu, Lu 7 Lie Que, etc. in order to adjust the energy of the entire body. Stimulating these above acupuncture points can improve the energy flow and decrease the pain sensation signals that the trigeminal nerve sends to the brain. The acupuncturist must ensure that the patient feels an electrical shock sensation from the needles. This treatment allows the energy to go to the trigeminal nerve to improve the energy flow and decrease the pain. Sharon was treated with a combination of Treatments # 2 and # 3 plus electrical stimulation of the acupuncture needles three times a week for three weeks. After the first visit, she felt better and reported getting a good night’s sleep for the first time in six weeks. After four weeks of treatment, the pain had subsided by 80%; thus, the treatments were decreased to once a month; after six months on this schedule, the patient told me he felt no more pain. In my experience, the treatment of this illness has two facets. First, there must be a clear diagnosis. In Sharon’s case, the dentist was wrong in the evaluation of the condition, and pulled two teeth unnecessarily. It is also necessary to combine western medicine with TCM in this case, and to treat all three of the nerve branches, if necessary. If the treatment is done properly, the patient’s pain should subside and he/she should be able to function normally in day-to-day life. You should combine the local points with the distal points for your treatment. Electrical stimulation is very important. Do not use moza in these kinds of cases. Seek for medical attention as early as possible. An ice-cold massage at the above points might decrease the pain. In the New Year, we all are facing a stressful time with new challenges because of the economy. You may sometimes have neck pain, headaches and/or poor sleep, etc. One of the possible causes of the aforementioned list might be occipital neuralgia. Please read the following case discussion; you may have some idea about it. You are welcome to send the news letter to your friends as long as it is not for commercial use. Linda, a 45-year-old female dental assistant, came to me complaining of severe headaches that started at the back of her head and continued down a portion of her neck. The pain also radiated up to her scalp, around her ears and sometimes into the bilateral temporal area. The pain was off-and-on, but occurred every day. The pain ranged from dull to sharp, and was sometimes located directly behind the right eye. As a dental assistant, she constantly turned her head to the right when dealing with patients. This caused the headache to become more severe, and she was frustrated that it interfered with her daily work. She had consulted several doctors about her condition, and had been prescribed Naprosyn, Percocet and Neurotin, but none of them alleviated her condition. These headaches intensified when Linda was under stress, which was often because of her job: if she had many patients waiting for her and felt under pressure, the headaches worsened. When I examined Linda, I discovered that when I pressed her scalp at the base of the skull and suboccipital area, the pain radiated to the back, front and side of her head, and also to the right side of the eye. When I pressed hard on the suboccipital area (the base of the skull) the pain was exacerbated and I could feel the bilateral temporal artery palpating. The patient probably suffers from occipital neuralgia, which is a cycle of pain spasms originating in the suboccipital area, caused by an inflammation of the occipital nerves. The two pairs of occipital nerves (each nerve contains a greater and lesser occipital nerve) originate in the second and third vertebrae of the neck. These nerves supply areas of the skin along the base of the skull and behind the ear, but are not always connected directly with the structures inside the skull. However, they do interconnect with other nerves outside the skull and continue into the neuro-network. Eventually they can affect any given area along the scalp, mainly on the bilateral temporal area behind the ear and sometimes connect to the nerve branch on either side of both eyes. Occipital neuralgia may occur continuously, often as the result of the nerve impingement, especially from arthritis, muscle spasm, or as the result of a prior injury or surgery. Sometimes these conditions will impinge the occipital nerve root, leading to severe headaches at the back of the head, leading to muscle spasm. Linda exhibits the severe form of occipitical neuralgia, most likely because her profession causes her to tilt her head in the same manner for a good part of her day. This stress causes the occipital nerve to be impinged, sending a constant signal to the nerve network in her scalp, leading to headaches and the pain behind her right eye. The clinical diagnosis of this condition is based on palpation by the doctor of the bilateral occipital nerve root, which will induce or trigger the headache. Doctors currently use various treatments. One option is to inject 1% lidocaine 5cc into the occipital nerve root, which decreases or relieves the pain, confirming the diagnosis. A second option is to use surgery to cut or burn the nerve with a radial wave probe. A third option is to use a small injection of Botox or a similar medication. Western medicines include anti-inflammatory or narcotics such as Percocet or Darvocet, Naurontin, anti-epilepsy medication, etc. For the majority, these medications do not work well, though occasionally they can reduce the occurrence and frequency of the occipital neuralgia. Some patients respond to physical therapy and massages to decrease the spasm of the neck muscle, which might temporarily relieve the occipital neuralgia. Though doctors may recommend surgery, many patients resist this type of treatment. According to Traditional Chinese Medicine, occipital neuralgia belongs in the category of the side headache, i.e. the Shao Yang Gallbladder meridian headache. Gallbladder meridians are distributed around the sides of the head, and excessive heat in the gallbladder can lead to headaches. The gallbladder meridian originates from the outside of the eye, and continues up the temporal nerve area, around the lateral skull area, down the occipital nerve area, down through the trunk and to the outside of the leg. If there is excessive heat along this meridian, there will be an imbalance of yin and yang. For example, if the patient undergoes stress, muscle spasm or arthritis, the nerve and the gallbladder meridian will be impinged. This, in turn, will cause the gallbladder to heat up, leading to excessive heat, an imbalance of yin and yang and a severe headache. Another meridian identified in occipital neuralgia by Traditional Chinese Medicine is the urinary bladder meridian, which starts from the inside corner of the eye, continues through the middle and the top of the scalp, and follows down the back of the trunk and into the back of the leg. Due to the connection between the gallbladder and urinary bladder meridians, heat in one will cause heat in the other to rise, generating pain around the eye, the temporal area and the scalp, and making the ensuing headache severe and highly unbearable. Therefore, the principal acupuncture treatment is to relieve this excessive heat in the gall bladder and urinary tract. The main acupuncture points used for treatment are: Du 20 Bai Hui, GB 20 Feng Chi, GB1 Tong Zi Liao, GB 8 Shuai Gu, Extra point Tai Yang, GB 34 Yang Ling Quan, SI 3 Hou Xi, Lu 7 Lie Que, Kid 6 Zhao Hai, Li 3 Tai Chong. Linda underwent my treatment three times a week for one month, resulting in immediate, short-term relief of her headaches. However, the headaches continued to plague her because of her strenuous work. In addition, her irregular menstrual cycle and hormonal changes led to more severe headaches. 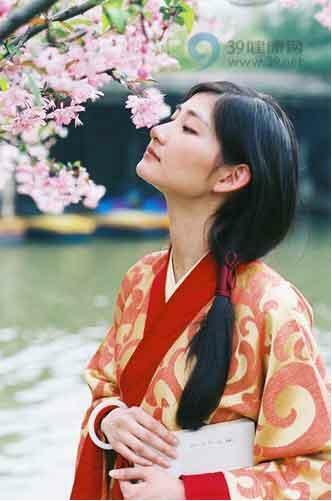 Thus, I also treated her for hormonal changes by utilizing a Chinese herb Da Zhi Xiao Yao San. The combination of acupuncture and herbal therapy seemed to be effective and, after about two months of treatment, Linda reported that her headaches occurred only infrequently and were very mild, and that she was satisfied with her treatments. Usually, acupuncture, with or without the addition of herbal supplements, can alleviate the problems and pain associated with these headaches. However, sometimes it is best to combine acupuncture with a nerve block (utilizing 4cc of 1% lidocaine plus 10 mg Kenalog mixed together) injected into both sides of the occipital nerve origin. One month of this combined treatment should give the patient 95% relief from his/her symptoms. 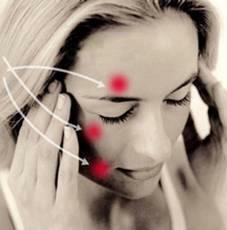 You should identify the location of the pain and tenderness, and treat the headache accordingly. 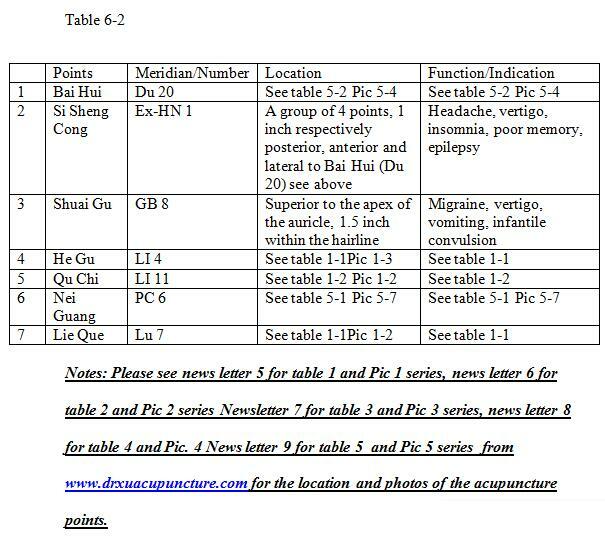 For example, the frontal headache belongs to the Yang Ming meridian; the temporal side headache belongs to the Shao Yang meridian; the top scalp headache belongs to the Jue Ying meridian. Always use Du 20 Bai Hui for all the different types of headaches. This is based on my personal experience over 20 years of practice. 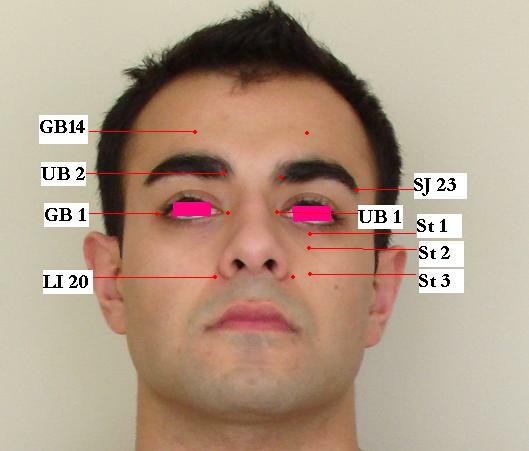 You should be very specific when describing the tender points on your head because each tender-point location belongs to a different meridian, and treatment varies based on each location. 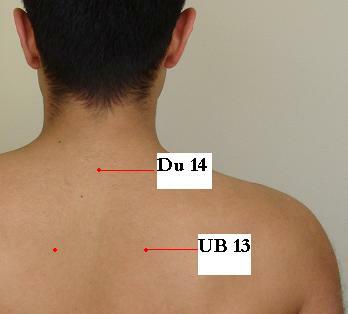 Massaging the Tai Yang and UB 20 Feng Chi points for 20 minutes, 2 to 3 times a day, will greatly decrease the headache. Year 2009 will be ending soon. We wish everybody happy holidays and a prosperous 2010. Please find the following news letter 12. We hope you will enjoy to read it. 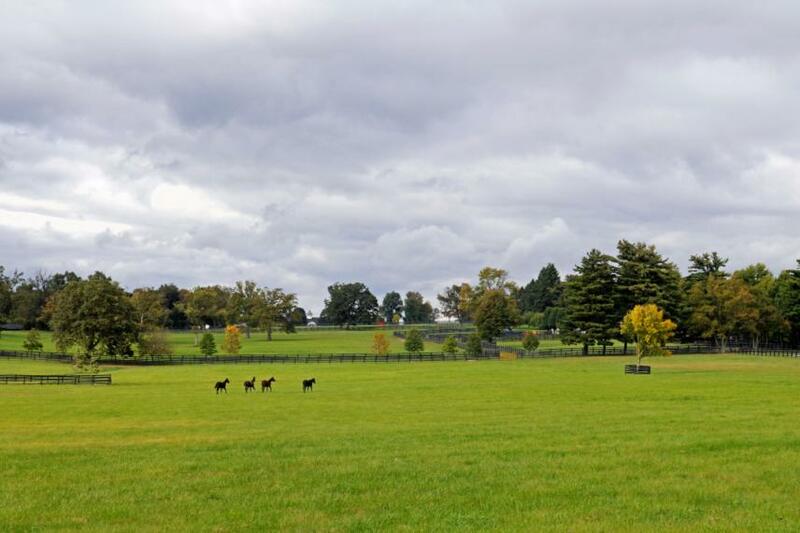 Dr. Jun Xu recently started to take photos; one is attached here. We hope to hear your comments. Jun Xu, M.D. Lic. Acup., Hong Su, C.M.D., Lic. Lisa L. is an 18-year-old female. Lisa’s mother brought her in for treatment because she had been complaining of neck pain for the past six years. The patient reports that, six years ago, when she woke up, she suddenly realized that her neck jerked to the left. The jerk happened very often; her neck would jerk two or three times every 5-10 minutes. The jerk was involuntary and occurred more frequently especially when she was tired or under stress. However, if she had a good night’s rest, felt energized, and focused on something (e.g. her favorite sports), she would not experience the sudden, involuntary neck movements. Only when she sat still, did her neck start to jerk. Lisa’s neck muscle always feels very tight, and the tightness can be very painful. She has been to many doctors and has tried everything, such as physical therapy and multiple medications, without any improvement. She therefore came to me for evaluation and treatment. Upon physical examination, I noted that the left side of the patient’s sternocleidomastoid muscle had hypertrophied. It felt like a thick rope on the left side of her neck. I also noted that other muscles had undergone hypertrophy: the levator scapular and splenius capitis at the cervicals. Throughout the entire physical examination, there was no jerk or involuntary contraction on the left side of the patient’s neck. What Lisa is suffering from is called cervical dystonia, which is the most common form of focal dystonia. Cervical dystonia is characterized by abnormal and spasmodic squeezing of the muscle that leads to muscle contractions in the head and neck area. The movements are involuntary and are sometimes very painful, causing the neck to twist repetitively, resulting in abnormal posture. Overall, this may affect a single muscle, a group of muscles, such as those in the arms, neck, and legs, or even the entire body. Patients with dystonia often have normal intelligence and no associated psychiatric disorders. may be a period of months between the injury and the onset of the dystonia. 1.Toxins and infections screening: blood or urine samples will confirm the presence of toxins and infections. 4.Electromyography (EMG) testing: measures electrical activity of muscles. An EMG can help diagnose muscle or nerve disorders. 1.Cogentin and Kemadrin are examples of drugs that decrease the level of acetylcholine. These have helped some patients but have sedating side effects. 2.Valium, Ativan, Klonopin, etc., regulate the neurotransmitter GABA. 3.Sinemet, Laridopa, etc. either increase or decrease dopamine levels. Botox injections can usually stop the muscle spasms by blocking acetylcholine, relieving the symptoms for approximately three months. Very experienced doctors should administer the Botox injections. If Botox is used for more than a one-year period, it will gradually become less effective because the patient’s body will begin producing auto-antibodies against it. In some severe cases, surgery may be an option. Surgery is the last resort and is used to selectively denervate the nerve supplying the muscle. small areas of the brain. According to traditional Chinese medicine, cervical dystonia is caused by excessive liver wind. The liver controls the movement of all tendons, muscles and joints in the human body. Excessive liver wind overstimulates the tendons, muscles and joints, constantly activating the muscles. The principle acupuncture treatment used to treat cervical dystonia reduces the excessive liver wind and thereby decreases the activities of the tendons, muscles and joints. 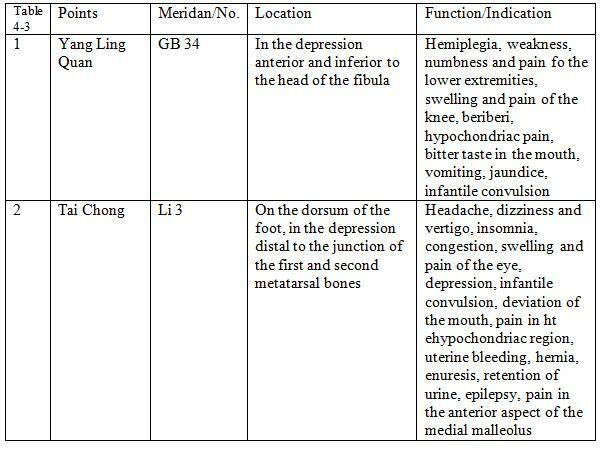 The acupuncture points are along the meridians of the liver and gall bladder, such as the Feng Chi and Tai Chong points. In addition, because patients with cervical dystonia have abnormal head and neck movements, acupuncture must also be used along the Du meridian, which controls head movement. The Du meridian supplies the entire brain. If the energy of the Du meridian is excessive, the entire head will move abnormally. Therefore, the acupuncture treatment should also include the Da Zhui and Hou Ding points from the Du meridian. These points will adjust and regulate the Du meridian, the yang, activate the tendon function, and balance the input and output of the energy of the Du meridian. The acupuncture treatment should also include the Xin Shu, a direct outlet acupuncture point from the heart and the Shen Shu, a connecting point from the kidney. Sheng Men, Tai Xi and the points listed above are involved in the circuitry of the heart and kidney, and will decrease the fire surrounding these organs, keeping the yin and yang in harmonious balance. 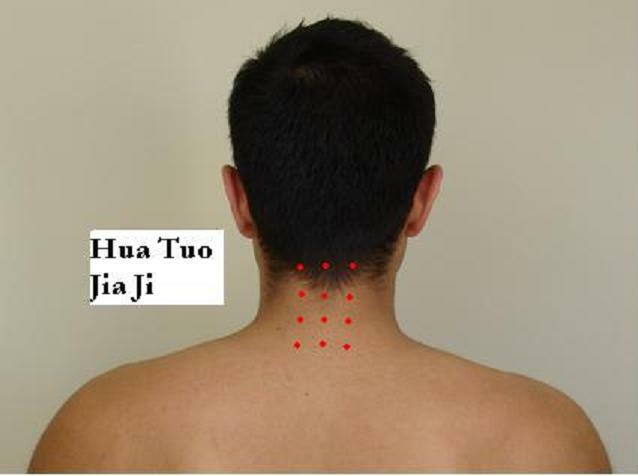 Some local points in the neck and head such as Tian Chuang, Tian Rong, Tian Ding, and Fu Tu, should also be used for their localized calming functions. This combination of local and distal acupuncture points will greatly decrease the symptoms associated with cervical dystonia. The patient was treated with acupuncture at the above points for approximately two months, three times a week. After the last treatment, the number of neck contractions had significantly decreased. Now, she only experiences mild neck jerks and contractions, allowing her to perform her daily activities in a normal manner. 1.Acupuncture cannot treat all forms of cervical dystonia. The milder the disease, the better the treatment results. 1.The earlier the treatment, the better the treatment results. 2.Help yourself with massage and heating pad. I assume that all of you are having a wonderful holiday season. Please find the following News Letter 11. We will discuss about drug abuse. It might give you some idea to help others. I wish you continue to have a wonderful holiday season. Jun Xu, M.D., and Hong Su, CMD., L. Ac. Peter W. is a 53 year old man who has been extremely successful in business. During his career, he built up a huge company which he sold for 20 million dollars in 2000. Afterward, he felt depressed and realized he had nothing to do which made him sluggish and without motivation, as he had no goal to pursue. He started using drugs, including heroin, which soon became a daily habit. When he was no longer to procure drugs easily in the United States, he turned to the internet and started ordering drugs by E-mail, which were sent to him from Africa. Though he had no real idea what he was using, he continued with his habit, which made him feel empty, depressed, anxious, restless and gave him insomnia, all of which caused a poor relationship with his wife and family. On some occasions he used so heavily he was unable to rise from his bed for a couple of days, on other occasions his family had to rush him to the emergency room. He felt occasional euphoria, followed by the deepest depression, and cloudy mental functioning. He knew this was not way to live, so he tried to find work that would engross him. For example, he took a charity job and helped the company build up cheap laptop computers for distribution to third world countries to help the young people there. In spite of this worthwhile work, he still felt empty. He took another job as V.P. and a seat on the Board of Directors in one of the biggest computer companies. He worked very hard at this new job, however, as soon as he stopped working or had leisure time he found himself reverting to drug use. Finally, he came to me for help, saying he wanted to quite drugs altogether. Heroin is a highly addictive, illegal drug, the most abused and most rapidly acting of the opiods. It is processed from morphine and naturally occurring substance extracted from the seeds of certain varieties of poppy plants. It usually appears as white or brown powder, and sometimes is mixed with sugar and other substances to cut its strength. Heroin has both long and short term effects. The short term effects include: depression, bad respiration, clouded mental functions, nausea, vomiting, spontaneous abortion. It is used medicinally for the suppression of pain, though under controlled conditions. In addition, heroin can cause temporary feelings of euphoria. Long term effects include addiction and infectious diseases such as HIV, AIDS, hepatitis B and C, collapsed veins, bacterial infection, abscesses, arthritis and pneumatic problems. In Western medicine there are many types of detoxification programs. The methadone is the most popular. Methadone is a synthetic opioid that blocks the effects of the heroin and eliminates withdrawal symptoms; this method has a proven record of success for heroin addicts. A pharmaceutical approach is the use of buprenorphine as another behavioral therapy. Buprenorphine offers less risk than methadone and can be prescribed in the doctor’s office. Bupherorphine and Suboxone is a combination drug product formulated to minimize abuse. The main functions of the acupuncture treatment are to decrease the withdrawal symptoms and improve the patient’s depression and brain function. There are many studies supporting these treatments and the most well known is that acupuncture can directly increase the level of endogenous endorphin, which makes the patient feel calm, relaxed and cheerful. Acupuncture can also directly stimulate the central nervous system to make the patient feel less depressed and lessen the craving for drugs. 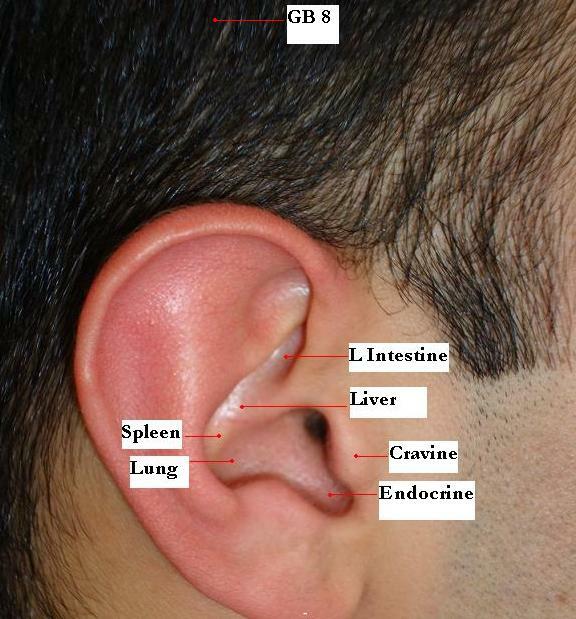 For auricular acupuncture, I use the lung, endocrine, liver, spleen and large intestine points corresponding to these organs. . The lung has an opening through the nose and when people abuse heroin, the lung point will protect the lung function and strengthen the immune system. The endocrine points increase endorphin secretion and increase people’s immune function to protect the entire body. Liver and spleen points improve circulation and also improve the taste in the mouth because the spleen and stomach have openings in mouth and large intestine points; the intestine and the lung have direct meridian connection, so if we improve the function of the large intestine, this in turn will directly improve the lung function. For the body acupuncture points, the most important ones are on the head. I use Baihui DU20 plus shi sheng chong Exn1, total five points, which can directly stimulate the central nervous system when I add electrical stimulation to the needles. They send current directly to the cortex of the brain, which greatly improves the patient’s mood and decreases the depression. Shuaigu GB8, which is on the head 1.5 inches above the tip of the auricular is directly connected to the sensory cortex, which will improve the body’s sensation and make it dislike the taste of heroin. Hegu L14 is a point that can largely increase endorphin secretion and Qu Chi L111 will give a better functioning effect. Neiguan Pc6 is a point of the pericardium meridian, which also helps improve mental functions. Lu7 is the point from the lung meridian which protects the lung from attacks of heroin and improves the immune function of the lung. After treatment of two weeks, the patient started to feel decreased withdrawal symptoms and had more energy. However, he sometimes still feels cravings for heroin, and he has some physical weakness, with muscle spasms in his arms and legs. He also experienced restlessness and agitation, often accompanied by insomnia. I continued the acupuncture treatments three to four times a week for eight weeks, while also discussing the short and long term effects of heroin use and what organs would be effected and harmed by continued use. He told me that, in spite of the withdrawal symptoms, he still felt much better with the treatments and he is happy to treat his addiction in this fashion, rather than go into a methadone program, at which point his drug use would become generally known. By coming to me, he can be treated in private for his addiction. Peter W. was also advised to make lifestyle adjustments and I encouraged him to work more for the charity. He traveled to Africa and Asia to actually see and meet the people using the inexpensive computers, and what it could do to improve their lifestyles. This experience touched him a great deal and after about 3 months of treatment he stopped using heroin entirely and is now completely clean. His insomnia, depression, anxiety and other symptoms are much improved and he is leading a normal life again. I assume you have had a wonderful summer. Now it is the time for our news letter 8 – allergy and sinusitis. If you think any of your friends or family members might be interested, feel free to forward this to them. I hope your friends and you will enjoy it. Jun Xu, M.D and Hong Su Xu, C.M.D. Dan J was a 16-year-old boy who came to me complaining of itchy and pinky eyes, difficulty breathing, headaches, and a runny nose which exuded yellow and green sputum for two weeks. The patient had experienced these symptoms on and off for more than five years and they got worse during the spring and autumn and better in the summer. He was diagnosed with allergies which sometimes developed into sinusitis. He was given Allegra, benadral and other antihistamine medication. At the beginning, this treatment helped, however, after about a week or two the medication stopped working. The patient was also given allergy shot with multiple antigens for more than one year. However, it seems not working too. His symptoms are very often developed to severe sinusitis headache, poor sleep and difficulty in concentration. His physician often has to prescribe antibiotics to prevent the infection further development. His mother is very concerned about the frequent usage of antibiotics, therefore today, he is brought to me. He reported he has all the symptoms listed above, with the addition of a minor outbreak of hives on his face and body. Allergies are an abnormal reaction to an ordinary, harmless substance called allergen. They are many different allergens, such as pollen, dust, fur and mold. When the allergens are absorbed into the body through inspiration or skin contact, people’s immune system will have a chain reaction, and the white blood cells will produce IgE antibodies. These antibodies attach themselves to mast cells which will cause the release of histamine and other potent chemicals. This histamine will cause a spasm of smooth muscle on the respiratory tract, sinus, skin, ear and other body parts and then leading to runny nose, watery eyes, itching, and sneeze. 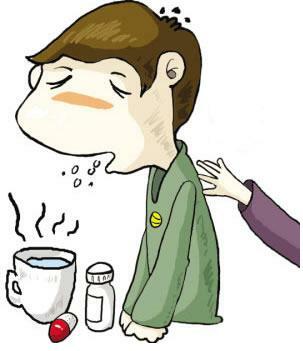 If the sinus is infected with virus and bacteria, sinusitis occur and patients will feel sinus headache and fever. 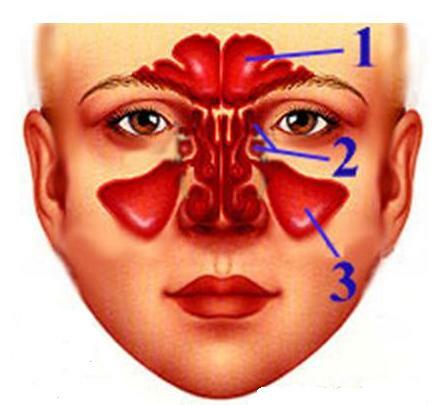 There are three major sinus: 1. Frontal, 2. Ethnoid and 3. Maxillary sinuses, which are easily infected or irritated with allergens. Symptoms can be from mild to severe and are usually treated with antihistamines, decongestants, cortisone products (which might produce long ranging side effects), local chain modifiers which will block the effects of inflammatory chemicals and mast cell stabilizers. Traditional Chinese Medicine (TCM) believes allergies and sinusitis are one disease with two different manifestations and stages. In the first stage, the patient’s immune system is weakened. When the weather changes, antigens, such as dust and mould increase and invade the human body through the skin, mouth and nose, casing symptoms of the lung and the liver. The symptoms of lung show shortness of breath and secretion from the sinus, the nose is the opening for the lung. If there is allergen invasion from outside, and the patient’s body is not strong enough to combat it – especially if the immune system is in a weak state – the weak immune system will make the lung symptoms worse. This is why different people face the same allergen invasion and have different responses. Most people are not allergic to dust, mould and the like. They have no problem with allergens. However, some people suffer from this condition because their immune system is weakened and their body energy is low, especially in the lung. The liver function corresponds to the eye, i.e. the opening outlet of liver is eye. Therefore, if the lever function is low and weak, the eye symptoms such as itchy, pinky and tearing eye are more prominent. Allergic sinusitis. 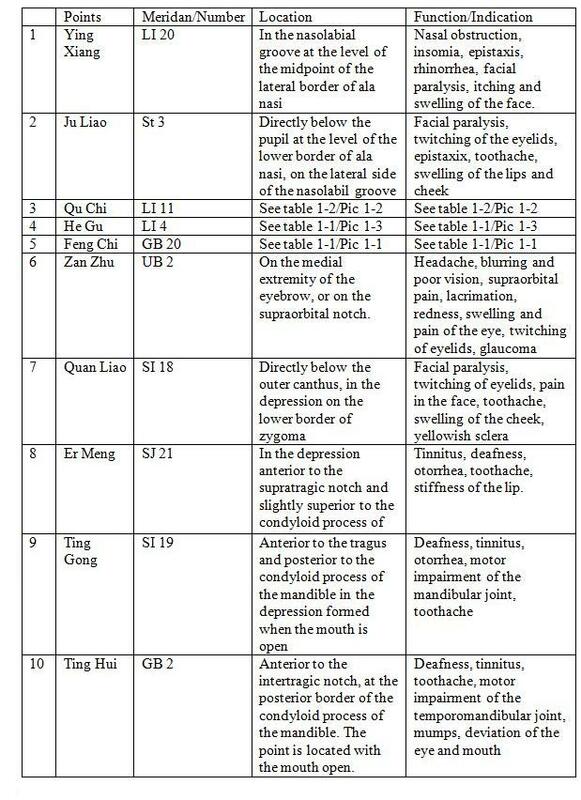 We use LI 20 (Ying Xiang), which corresponding to maxillary sinus, LI11 (Qu Chi), LI 4(He Gu) and GB 20 (Feng Chi). 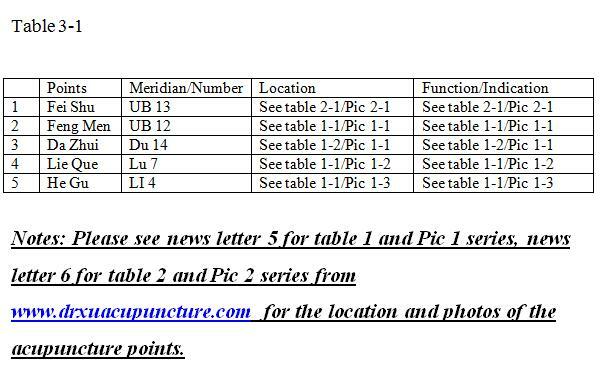 Notes: Please see news letter 5 for table 1 and Pic 1 series, news letter 6 for table 2 and Pic 2 series Newsletter 7 for table 3 and Pic 3 series from www.drxuacupuncture.co for the location and photos of the acupuncture points. 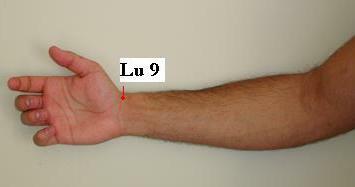 The key acupressure points are LI 20, UB2 and GB14. You will feel your sinus opening by pressing the above points in both sides for 5 min of each and 2 to 3 sessions. Irrigating your sinuses with normal saline or some Chinese herbs solution might give you a significant improvement. By electrical stimulation the points of LI 20 (Ying Xiang), UB 2 (Zan Zhu) and GB 14 (Yang Bai), you may give patients a surprise that their sinusitis and headache might go away within one to two sessions, because the above points may increase the opening of the sinus and drain the sinus. The patients will feel “the pressure over the sinus” are much less after the treatment. 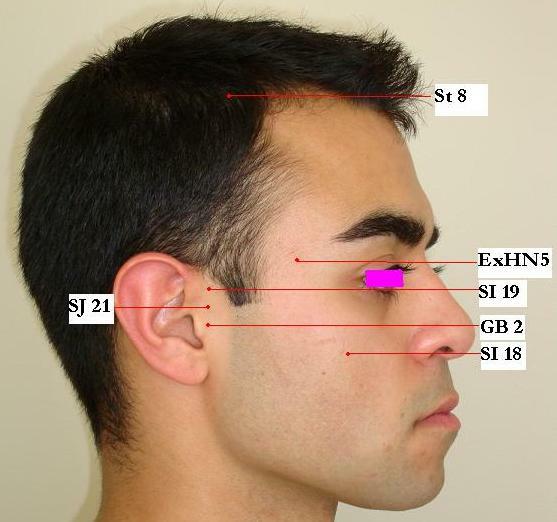 LI 20 (Ying Xiang) is the outlet of the large intestine meridian and is adjacent to the nose, thus LI 20 connects the nose to the sinus after stimulation of the point. By stimulation of points of LI 20, UB 2 and GB 14, the treatment desensitizes the mucus membrane and decreases the amount of secretion. Hu Gu is the original location of the large intestine point, which can make the invasion of the allergen decrease and also will expel the allergen from the body. GB 20 (Feng Chi) will enhance LI 4 (He Gu) of the function to expel the invasion of the allergen. 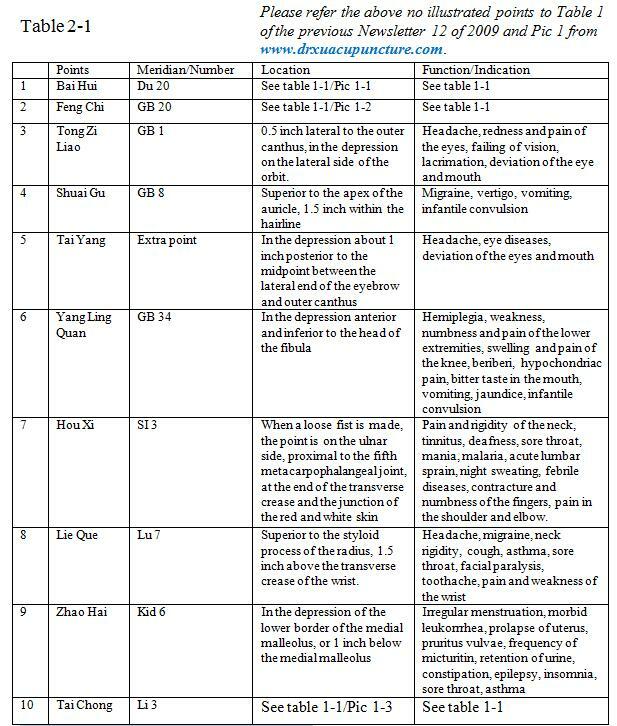 For allergic eye symptoms we use GB20 (Feng Chi ), LI11 (Qu Chi), LI 4(He Gu) plus the followings, St 1 (Cheng Qi), St 2 (Si Bai), SJ 23 (Si Zu Kong) GB 14 (Yang Bai), GB 1 (Tong Zi Liao), UB 2 (Zan Zhu), UB 1 (Qing Ming), ST 8 (Tou Wei) and Ex-HN5 (Tai Yang). For itching in the ear, add SJ 21 (Er Meng) and SI 19 (Ting Gong), GB 2 (Ting Hui). For patient with itching ear and tinnitus, SI 19, SJ 21 and GB 2 are the best choice. You may press the above points for 3 to 5 min, 2 to 3 sessions per day for 2 weeks, you will realize the beauty of the points. 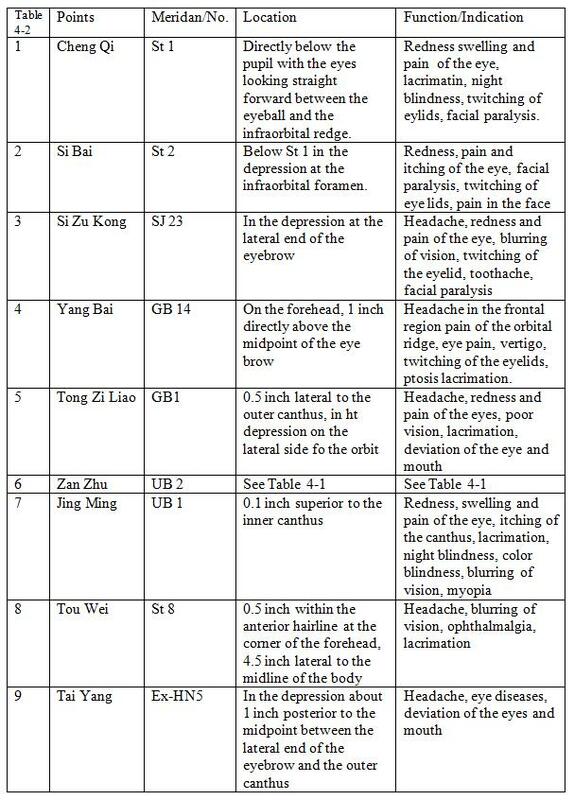 For tearing and itching eye, GB 1, UB1 and St 1 are good choice. 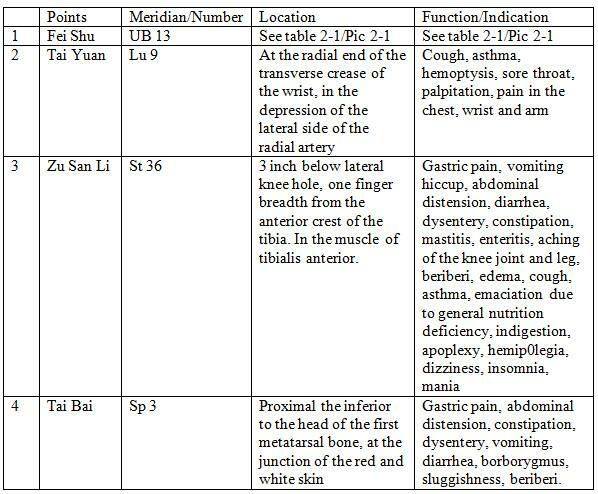 Kidney Yang deficiency accompanied with symptom of cold in all 4 extremities, fatigue, and clean and long urine: add UB 23 (Sheng Shu) see Pic 3-1 and table 3-4. Gall Bladder fire excess accompanied with symptom of thirty, bitter in the mouth, inflamed eye, add GB 34 (Yang Ling Quan) and Li 3 (Tai Chong). GB 20 (Feng Chi) ( See Pic 1-1 and table 1-1) protects the patient from the allergen invasion and strengthens the immune function of the human body. 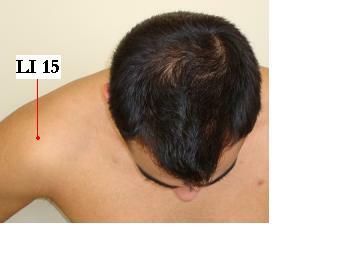 St 8 (Tou Wei) and Ex-HN5 (Tai Yang) are around the scalp, and will decrease headaches. Initially Dan J underwent my treatment for four visits. On his first visit, after about 20 minutes, his eyes were dry and his sinuses had stopped running, which made him happy and much more comfortable. With three more treatments, his symptoms were almost gone. After discussing the case with his mother, Dan J came back for continued treatment, for a total of ten visits. His problem was mainly due to a weakened immune system with deficiency of Kidney and Lung. he needed acupuncture to help him improve these systems, thus casting off the effects of allergens on his body. After subsiding his symptom, Dan was advised to return to my office during summer for about 12 visits, even then he did not have any symptom. After these treatments, Dan’s immune system was much strengthened, he only needed to come to me at the beginning of the next few allergy seasons for five to six visits. Recently, however, his symptoms are so much improved, that he no longer needs to consult me, even at the beginning of new allergy season. “Strengthening your Yang in the summer, nourishing your Ying in the winter” is the wisdom of Traditional Chinese Medicine, which guides TCM practitioners for more than two thousand years. It means that the patients of allergy, sinusitis and asthma should be treated during summer for strengthening their Yang, i.e. immune system. 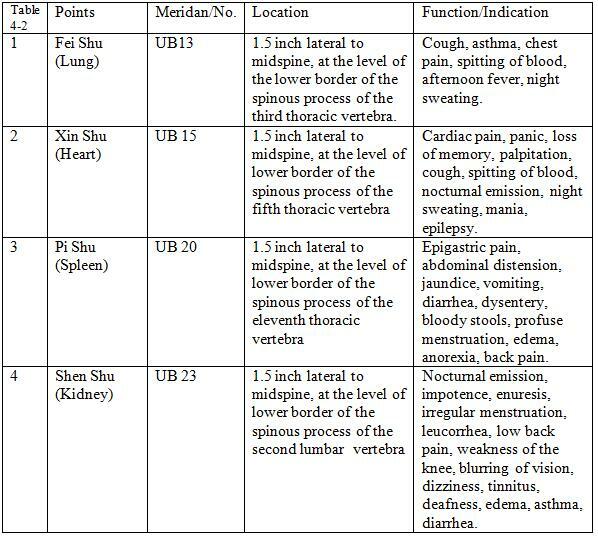 The acupuncture points are UB 13 (Lung, Fei Shu), UB 15 (Heart, Xin Shu), UB 20 (Spleen, Pi Shu) and UB 23 (Kidney, Shen Shu). This is the reason I requested Dan J came to my office during summer for 12 visits. Now, it is the time for our News Letter 7. 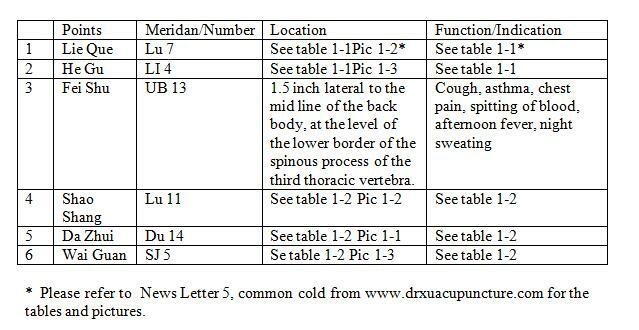 We will describe the bronchitis and its medical and acupuncture treatments in the News Letter 7. Please enjoy the info we provide, it might help you for your family members or friends. You may call our office at 203-637-7720 for further info. Jimmy S is a 12-year-old boy who came to my office after a sudden onset of shortness of breath and tightness in the chest. In addition he said he had occasional pain and trouble in sleeping and, by listening to his lungs, I heard audible wheezing. He sometimes had coughs as well, and his mother reported he first developed these symptoms when he was 2 years old. The incidents happened mostly in cold weather, and sometimes when he ran or participated in sports. At these times he had difficulty in breathing, often coughed or wheezed and all this together brought about a diagnosis of asthma. His doctor prescribed an inhaler and other medication, which, for a while, made his asthma better. However, for the past decade, though he used these asthma-aids, he still had frequent attacks. These made him miss classes which bothered him, as he wanted to keep up with his schoolmates. His primary care physician could give him no further help, at which time he consulted me. Asthma is an inflammation and constriction of the lungs and airways, including brachial tubes. Asthma is usually triggered by cold, allergens, including dust, mould, perfume, fur, etc, respiratory infection such as the common cold and physical activity such as exercise, cold air and irritants such as smoke. Certain medications also can trigger asthma, such as aspirin and non-steroid anti-inflammatory drugs, as well as strong emotion, stress, gastroesophageal reflux disease, menstrual cycles and allergic reactions to certain foods. After exposure to these irritants, the airways produce extra mucus that blocks them and makes the brachial wall muscle tighten and constrict, which causes all the symptoms of asthma such as cough, shortness of breath and wheezing. If symptoms become worse, some patients will get an infection which will produce yellowish sputum and this infection will cause more severe symptoms. Asthma is usually worse in the morning and late at night. In between asthmatic episodes, symptoms have been known to disappear or improve, but this does not mean the asthma has gone away, which is why Jimmy S has had these symptoms for more than ten years. Allergic asthma, caused by the airway inflammation when exposed to allergens, such as dust, mould, smoking, fur, perfume, food, etc. Exercise-induced asthma, which is triggered by vigorous activity. Cough-variant asthma, which produces a chronic and persistent cough, sometimes called a habitual cough, without shortness of breath. Occupational asthma, caused by exposure to certain stimulants, such as certain chemicals, oils, gas, etc. in the workplace. Bronchodilators such as beta-agonist, albuterol and salmeterol and also anticholinergics such as ipatropium. These two types of medications can dilate the respiratory tubes and open the lungs to air. Corticosteroid. The inhaled corticosteroid is recommended for most patients and is most effective for the respiratory tract and with minimal effect on the rest of the body at normal doses. These are good for short-term relief if inhaled or given by injection to speed up the resolution of airway inflammation. It is strongly recommended for people with asthma to carry their inhalers with them, in case any emergency happens to them. The above precaution sometimes plays a role of life or death. However, for a long term treatment, the Chinese medicine might help more. Asthma is characterized by repeated attacks of paroxysmal dyspnea with wheezing. It can be divided into two types, deficiency and excess. 1. Wind-cold type. This kind of asthma attack is due to the invasion of wind-cold pathogen from environment which impairs the smooth flow of the lung qi (energy), injures the skin and hair and makes the lung respiratory tract, especially the bronchial tract, closed or restricted. Since the lung and the body surface defense system are weakened, the lung qi fails to disperse and descend which leads to a cough. 2. Phlegm-heat type. This type asthma is due to the failure of the spleen in transformation and transportation resulting in the production of phlegm from accumulated dampness, finally ending in retention of phlegm which turns into heat or excessive fire of the lung which evaporates the fluids which caused the accumulation of phlegm. The phlegm stays in the lungs with hotness, causing the lung energy to stagnate, which causes the impairment of the lung’s proper function, then causes asthma. Lung deficiency. A prolonged and protracted cough usually weakens and injures the lung energy, and strain of an internal lung and respiratory muscle can also bring about deficiency of the lung energy. In either case, shortness of breath and dyspnea may occur. Kidney deficiency. Since the kidney is the energy resource of the human body, longstanding asthma, overwork and other factors will affect the kidney function, therefore, if kidney deficiency is present, its energy cannot support lung functions, which will induce weakness of the kidney and make an asthma attack that much more severe. For wind-cold type the principal is to eliminate the exogenous pathogens as well as improve the lung’s function and enrich the lung’s energy. Prescription: UB13 Fei Shu, UB12 Feng Men, Du14 Da Zhui, Lu 7 Lie Que, LI 4 He Gu. The most important points are UB 12, UB 13 and Du 14. Press UB 13 for 5 min with both your knuckles, then UB 12 for another 5 min, alternate for about 3 times might help you to reduce the asthmatic symptom and the patient might feel relief from the acupressure self treatment. 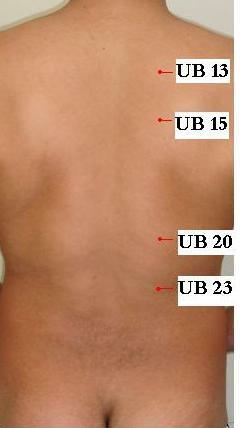 Electrical stimulation on UB 12, UB 13 and Du 14. Ultra Red Heating Lamp on UB 12, UB 13 and Du 14 for 20 to 30 min. 3. UB13 and UB12 are located in the vicinity of the lung, which will greatly improve the lung’s function and energy and will protect the lung from the exogenous pathogens attacking. They will clear the lung and eliminate the wind. 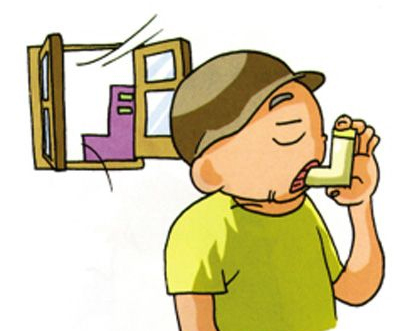 DU14, Lu 7 and LI4 function to eliminate the wind-cold and clear the lung, therefore soothing the asthma. Phlegm heat: Because phlegm heat shows signs of mild infection of the lung, there are more points to choose from for eliminating the exogenous pathogens such as wind heat. Prescription: UB13 Fei Shu, EX-B1 Ding Chuan, Ren 22 Tian Tu, and Lu 5 Chi Ze , St 40 Feng Long. Press hard on bilateral EX-B1 Ding Chuan for 5 min, then UB 13 Fei Shu for 5 min, alternate for 2 sessions. Ren 22 Tian Tu may also help to decrease the asthma after pressing for about 5 min. Use all above 5 points and electrical stimulation for 20 to 30 min. If they are pairs, you should use the paired points also. 3. Lu 5 Chi Ze is very important to reduce the phlegm heat and soothe the brachial smooth muscle. Fenlong S40 is a point of strengthening the spleen function which resolves the problem of phlegm. 4. UB13 Fei Shu is applied to clear the lung and regulate the flow of energy. Ren 22 Tian Tu causes the energy to subside and resolves the problem of phlegm, as well as eliminating excessive heat. Dingchaun is the point which causes a cessation of wheezing and makes breathing much easier. Lung deficiency: The lung is the vital internal organ to regulate respiration. Lung energy deficiency leads to the easy entry of the pathogens, and causes asthma. The goal is to improve the lung energy and efficiency and decrease the chance of the body being attacked by exogenous pathogens. Prescription: UB13 Fei Shu, Lu 9 Tai Yuan, St 36 Zu San Li and Sp 3 Tai Bai. For long term health care, always press St 36 and UB 13, even you do not have any illness; these two points will protect you from the attack of external pathogenesis. Lu 9 and Sp 3 for acute attack. Heating Lam should be used for St 36 and UB13. Electrical stimulation for LU 9 and Sp 3. Lu 9 Tai Yuan is the beginning point of the lung meridian and is able to reinforce the lung energy. 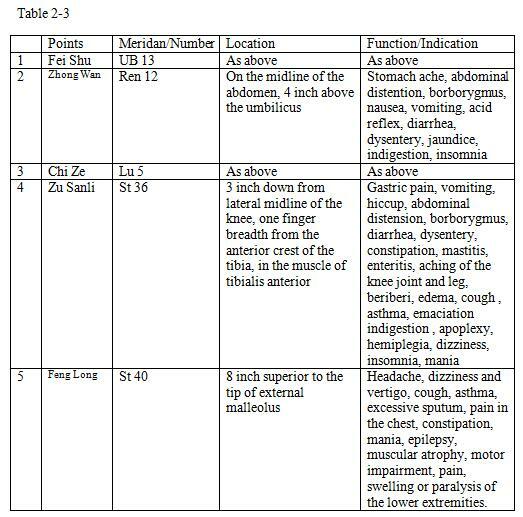 UB13 Fei Shu, used in both acupuncture and moxibustion, can strengthen the lung energy, and St 36 Zu san li S36 is the key point of the stomach meridian, which can greatly improve the immune system and energy of the entire human body. Sp 3 Tai Bai is the first point of the spleen meridian. The spleen can greatly improve the lung’s breathing function, therefore, Sp 3 can both clean out the phlegm and relax the smooth muscle of the brachial tract. St 36 and SP 3 combined will strengthen the lung and improve the function of the spleen and stomach. The kidney is the energy manufacturer of the entire human body. Any lessening of its function will cause a decrease of the immune function and energy flow of daily activity. For this reason it is necessary to strengthen the kidney. UB13 Fei Shu, REN17 Tan Zhong, K3 Tai Xi and UB23 Shen Shu, and REN 6 Qi Hai are selected. UB 23 is the key point to press. UB 13 and Ren 17 will greatly help in strengthening the kidney function. Heating Lamp should be used for UB 23 and UB 13. 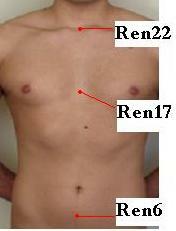 Electrical stimulation for UB23, Ren 17 and Ren 6. Ki 3 Tai Xi strengthens the primary energy of the kidney and, when combined with UB23 Shen Shu, the original point adjacent to the kidney, it will greatly enhance the Ki 3 functions. REN17 Tan Zhong is one of the most important energy points in the eight influential points and UB13 Fei Shu is the back-shu point of the lung which reinforces energy and smoothes out ragged breathing. Ren 6 Qi Hai is an important point to reinforce lung energy and recreate energy in the lower lung respiratory track and also strengthens the kidney and primary energy. Asthma attacks usually happen in fall, winter and spring, and only occasionally in the summer. Based on traditional Chinese medicine, summer is the most important season to reinforce the kidney and spleen Yang energy. I insist patients having treatments during the summer. I use not only acupuncture but also moxibustion, i.e. Moxa during summer. One treatment in summer is probably the equivalent of four or five treatments at any other season. Utilizing the previously cited points in acupuncture, it is possible to alleviate chronic asthmatic symptoms by strengthening the energy and improving function of spleen, as well as that of the stomach and kidneys. In this way it is possible to relieve, or even eradicate future attacks. Jimmy S received a dozen treatments from me during the first summer. During the school year, he worked very hard at his studies. His summer treatments helped him so much that he only needed to consult me each summer for a few visits. Thank you very much and have a wonderful July 4th! Jun Xu, M.D., & Hong Su Xu, C.M.D. Susan W., a 45-year-old female. came to my office complaining of a severe cough which had lasted for about three or four weeks. It caused her tremendous pain on her chest and abdominal muscle and she also coughed out yellowish greenish phlegm and sometimes experienced wheezing and shortness of breath; she also was running a low fever and had chills and muscle aches. She also suffered nasal congestion and sore throat and had difficulty swallowing food. Her ears were blocked, making it difficult to hear, and she was extremely uncomfortable in many areas when she came to me for evaluation and treatment. 1. Acute bronchitis. It will last about several days to weeks and usually it will clear up on its own. 2. Viral bronchitis. This is triggered by viral infection such as common cold. 3. Occupational bronchitis. Patients are exposed to lung irritants in one’s home or work place and the treatment usually is withdraw from the place. 4. Chronic bronchitis. The above symptoms will last for longer than three months or recur at a frequency over period of years so this chronic bronchitis usually is not caused by infection but is very often associated with chronic obstructive pulmonary disorder. 5. 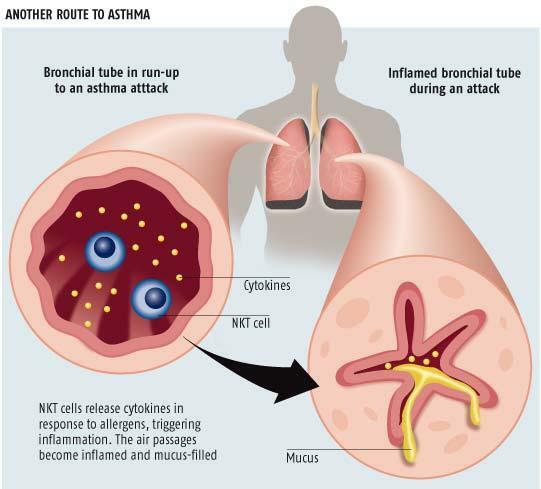 Asthmatic bronchitis refers to the same symptoms but the underlying cause is asthma. Traditional Chinese medicine believes bronchitis is a lung disease which results either from attack of the exogenous pathogenic factors or from disorders of the lung itself. 1. Wind cold: The main manifestations are cough, itching in the throat, thick white sputum, and the patient is easily susceptible to cold, with symptoms such as fever, anihidrosis, headache, nasal obstruction and discharge with thin white tongue coating, and superficial pulse. 2. Wind heat: The main manifestations are choking cough with yellowish thick sputum, thirst, sore throat, fever, headache, and the patients are aversion to wind and with symptom of sweating, with thin yellow tongue coating and superficial and rapid pulse. For the internal organ injury of the lung, there are two types. 1. Blockage of the lung by phlegm. The main manifestation is cough with profuse, thick white sputum and stuffiness and congestion of the chest, loss of appetite, white sticky tongue coating, and rolling pulse. 2. Dryness of the lung with deficiency of yin. This is manifested by dry cough without sputum or with scanty sputum, dryness of the nose and throat, sore throat, spitting – or even – coughing of blood, afternoon fever, malar flash, red tongue, with thick tongue coating, and rapid pulse. By far the majority of bronchial cases are originally from viral infections, this means that most cases of bronchitis are short term and require nothing more than symptomatic treatment. Since antibiotics do not cure a viral illness, overuse of antibiotics will make the bacteria habituated in the respiratory tract resistant to the antibiotics currently available. Many doctors prescribe antibiotics because they feel pressure from the patients. If they do not prescribe certain antibody, then the patient will think the doctor did nothing to help. We can use acetaminophen to control the fever, such as, Tylenol, aspirin, or ibuprofen. Also the patient should drink as much fluid as possible in order to clear the body, dilute the virus and to make the virus dissipate in the body’s fluid. A humidifier might also help and over-the-counter cough suppressants such as the Robitussin and Mucinex might also assist in loosening the secretions. Bronchodilator inhalers will help open airways and decrease the wheezing. If there is bacterial infection, then antibiotics should be prescribed. 1. For wind cold. You may choose acupuncture points such as Lu 7 Lie Que, LI 4 He Gu, and UB13 Fei Shu (Lung Shu), and with supplementary points for pain and swelling of the throat, Lu11 Shao Shang, and for fever and aversion to cold Du14 Da Zhui and SJ 5 Wai Guan. 2. For wind heat: UB 13 Fei Shu, Lu 5 Chi Ze, Du 14 Da Zhui, LI 11 Qu Chi. 3. 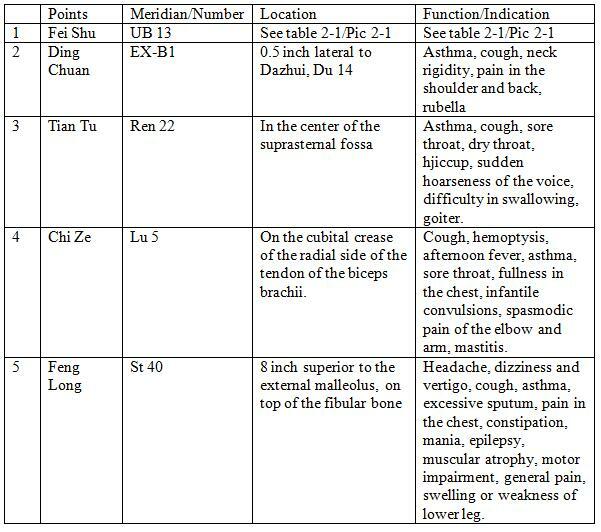 For the internal lung injury with the blockage of the lung by phlegm, so we select back-shu points and other lung points: like UB13 Fei Shu, Ren 12 Zhong Wan, Lu 5 Chi Ze, St 36 Zu San Li, St 40 Feng Long. 1. The most important points are Fei Shu, UB 13. Ask your friend or family member press the points on both side for 5 min each, alternately press until you feel energy flow go through your lung. 2. If you have fever or feel very cold, press Da Zhui, Du 14 for 10 min, then press Fei Shu. UB 13, which will greatly improve your immune ability and quickly decrease your cough and respiratory symptom, such as cough, sneeze, etc. 1. Always electrically stimulate Fei Shu , UB 13. If the patient has wind cold, Lie Que, Lu 7 and Da Zhui, Du 14; for wind heat, Qu Chi, LI 11 and Da Zhui, Du 14. 2. Combined Fei Shu, UB 13 with Zu Sanli St36 and Feng Long, St 40, you may greatly improve your patient’s immune function. The above patient was diagnosed to have wind cold so after the treatment for about one week and her symptoms disappeared and she returned to work. Emily M. is 59 years old female. About one week ago, when she opened her garage and tried to take her garbage can out of her house, she had a fall and she immediately felt severe pain in the right hip and she had difficulty to getting up from the ground. Her husband immediately called 911 and Emily was taken to the hospital. 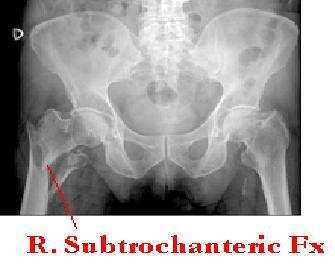 In the ER an x-ray was done which showed a fracture (Fx) of the right hip. The patient had an immediate operation for a total hip replacement because she had severe osteoporosis and her bone age is more than -2.5 SD as shown by a bone scan. After the operation, she came to my office for rehabilitation, and she asked me why it is so easy to have a fracture. Her friends sometimes had falls without any problems. She wanted acupuncture treatments and also a nutritional consultation about her osteoporosis. I asked her past medical history. When she was young Emily was an athlete. She ran about five miles a day five days a week for about 10 years, so she was very thin and skinny during this period. When she was between 16 and 26 she rarely menstruated. After she stopped her marathon training she gradually recovered her menstruation. Then, she got pregnant. She has two children and she told me her mother also had a fall at age 55 and also had a Lumbar 4 and 5 veterbrate compression fracture. She asked me if there was any connection between her mom’s fall and her own. Emily has osteoporosis, which is often seen in women of postmenopausal age and men above age of 75. Osteoporosis usually does not show any symptoms until one day a fracture occurs. Women and men with osteoporosis most often break bones in the hip, spine, and wrist. The fracture of the bone in an old person could be a warning sign that the bone is weaker than optimal. A fracture of the long bone such as hip and wrist are acute impaired mobility, and they require surgery. The symptoms of vertebral collapse, usually exhibit sudden back pain often with radicular pain shooting down to the legs with numbness and tingling sensation. This fracture usually is called a compression fracture and by x-ray, you can see the vertebral collapse. If there are multiple vertebral fractures (Fx), you will see the patient has a stooped posture, loss of height, and chronic pain with reduction of mobility. All post menopausal women and men age 50 and older should be evaluated clinically for osteoporosis risk factors in order to determine the need for bone mineral density testing. Osteoporosis is preventable if we identify the risk factors for the patients and therefore a fall causing the fracture of a bone can be avoid. Genetic factors: There are many genetic factors that will cause osteoporosis such as parental history of hip fracture, cystic fibrosis, hypophosphatasia, idiopathic hypercalcinuria, etc. 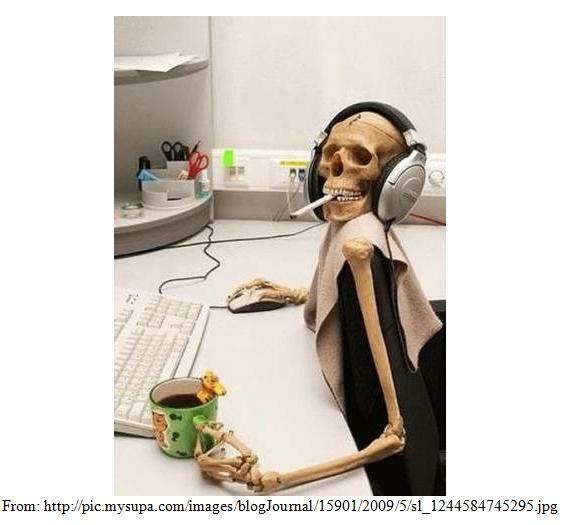 Lifestyle factors such as low calcium intake, vitamin D insufficiency, excessive vitamin A intake, high caffeine intake, high salt intake, alcohol: three or more drinks a day, immobilization, inadequate physical activity, smoking, tennis, and excessive physical activity. There are numerous examples of marathon runners who develop severe osteoporosis late in life. In women, heavy exercise can lead to decreased estrogen levels, which inhibit the calcium absorption and produce osteoporosis. In addition, intensive training without proper calcium and vitamin D and nutrition compensation will increases the risk of osteoporosis and fracture. Soft drinks, which contains phosphoric acid may increase the risk of osteoporosis because the phosphoric acid will displace calcium contained in the bone. Medications: Many medications are associated with osteoporosis and fracture. 1). Glucocorticoids i.e. steroid. If you take more than 5 mg per day of prednisone or equivalent for more than three months, usually it will cause osteoporosis. 2). Anticoagulants such as heparin. 6). Cyclosporin A, tacrolimus, lithium, etc. 1). Endocrine disorders such as Cushing’s syndrome, hyperparathyroidism, thyrotoxicosis, diabetes mellitus, adrenal insufficiency, etc. 2). Malnutrition, parenteral nutrition, and malabsorption such as Crohn’s disease, ulcerative colitis, lactose intolerance, gastrectomy surgery, intestinal bypass surgery or bowel resection, vitamin K and vitamin B12 deficiency, etc. Hematological disorders such as multiple myeloma, leukemia, lymphoma, sickle cell disease, etc. Hypogonadal disease such as Turner syndrome, Klinefelter syndrome, Kallmann syndrome, anorexia nervosa, etc. Osteoporosis is more common in elder individuals and Caucasian woman, but osteoporosis can occur at any age in men as well as in women and in all ethnic groups. About 10 million Americans have osteoporosis, 80% of them are women. One in two women has a fracture related to osteoporosis in her lifetime. Thus, women over the age of 50 are at greatest risk of developing osteoporosis and suffering related fractures. Osteoporosis can begin at a young age if a person does not get enough calcium and vitamin D. After reaching maximum bone density and strength between the ages of 25 and 30, a person loses about 0.4% of bone strength each year. At this rate and with good nutrition, people should experience bone loss without developing osteoporosis. However, after menopause, women lose bone mass at a higher rate as high as 3% per year. After menopause, a women’s body makes much less estrogen. Estrogen is a hormone substance that flows in the blood to control body functions. It helps to prevent osteoporosis. In fact, osteoporosis is secondary to the body that cannot make enough new bone and to compensate the body’s loss of the old bone. The dual-energy absorptiometry DXA measures the hip and the spine bone density to establish or confirm the diagnosis of osteoporosis, predict future fracture risk, and to monitor patients by performing serial assessments. WHO, the World Health Organization has established the following definition based on BMD (Bone Mineral Density) measurements at spine, hip, or forearm by DXA devices. Normal BMD is within 1 SD of a young normal adult, T-score at 1.0 and above. 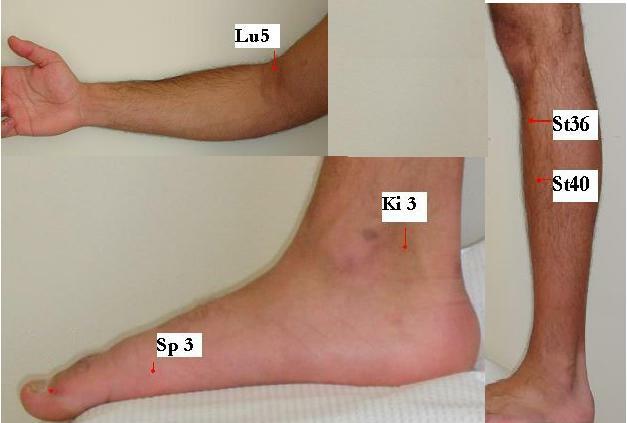 Low bone mass osteopenia, BMD is between 1.0 and 2.5 SD (Standard Deviation) below that of a young normal adult, i.e. T-score between -1.0 and –2.5. Osteoporosis, BMD is 2.5 SD or more below that of a young normal adult, T-score at or below –2.5. Patients in this group who have already experienced one or more fractures are deemed to have severe or established osteoporosis. Who should be tested for BMD? Based on National Osteoporosis Foundation conditions’ guide, the following people should be tested for BMD. 1. In women age 65 and older and men age 70 and older, recommend BMD test. 2. In postmenopausal women and the men age 50 to 69 recommend BMD testing when the doctor has concerns based on their risk factor profile. Recommend BMD testing to those who have had a fracture to determine degree of disease’s severity. 1. The most important treatment is prevention. Calcium 1000 mg per day should be taken for women before menopause and a 1200 mg per day for women who are postmenopausal. Vitamin D 800 IU for women before menopause and 1000 IU vitamin D for postmenopausal women. Men up to age of 50 should increase vitamin D and calcium intake to 800 IU of vitamin D and 1000 mg of calcium per day. There are numerous calcium products in the market. Most of them are in tablet form, which is difficult for your body to absorb, because the calcium supplement is not blended with vitamin D and magnesium; these are necessary to aid in the absorption and use of calcium. Even if the calcium tablet is blended correctly, it may be difficult for the body to utilize or break down the calcium. One explanation may be that many calcium brands use calcium from eggshell or oyster shell. These may not be well absorbed by the body. Another reason calcium may not be absorbed from a tablet is because of DCP, which is a binding agent used to hold the tablet together. DCP does not break down in the body. In addition to binders, some calcium supplements may have additives such as chlorine and other chemicals. Even assuming no binders are used in the calcium tablet, the body must still break down a hard-pressed tablet into a usable form. If the tablet cannot be broken down sufficiently in the stomach, then the calcium will not be absorbed. If you can’t break down the calcium your body is robbed of the calcium needed to support bodily functions. Based on the above analysis, I strongly urge you not take the tablet form of calcium. After careful study, I believe that Nutrametrix supplies the best calcium, i.e. blended with Vitamin D3 and magnisium, isotonic form. 2. Regular weightbearing exercise. Increased walking, jogging, tai chi, stair climbing, dancing, and tennis. Muscle strengthening exercises include weight training and other resistive exercise. Weightbearing exercise programs not only increase bone density but also improve both heart and lung functional ability and muscle strength. 3. For prevention, you should take all preventative procedures such as checking and correcting vision and hearing, evaluating any neurological problems, reviewing any prescription medications for side effects that may affect balance, and providing a check list for improving safety at home. Wearing undergarments with hip pad protectors may protect an individual from injuring the hip in the event of a fall. Hip protectors may be considered for patients who have significant risk factors for falling or for patients who have a previously fractured hip. 4. Avoidance of tobacco use and excessive alcohol intake. Alcohol and cigarettes inhibit osteoblast cell activities and improve osteoclast cell functioning. Osteoclast cells usually destroy the bone density and osteoblast cell build up the bone density. 1. For the patient who has vertebral or hip fracture. 2. DXA hip or spine T-score is less or equivalent to –2.5. 3. Low bone mass and US adopted WHO 10-year probability of hip fractures more or equivalent to 3% or 10 years probability of any major osteoporosis related fractures more than 20%. Alendronate, brand name, Fosamax. Alendronate reduces the incidence of spine and hip fractures by about 50% over three years in patients with prior vertebral fracture. It reduces the incidence of vertebral fractures by about 48% over three years in patients without prior vertebral fracture. Ibandronate, brand name, Boniva. Boniva reduces the incidence of vertebral fractures by about 50% over three years. Risedronate, brand name, Actonel with calcium. Risedronate reduces the incidence of vertebral fractures by about 41& to 49% and the nonvertebral fractures by about 36% over three years with significant risk reduction occurring after one year of treatment in patients with a prior vertebral fracture. Zoledronic acid, brand name, Reclast. Zoledronic acid is approved by FDA 5 mg/IV infusion over at least 50 minutes once yearly for osteoporosis in postmenopausal women. 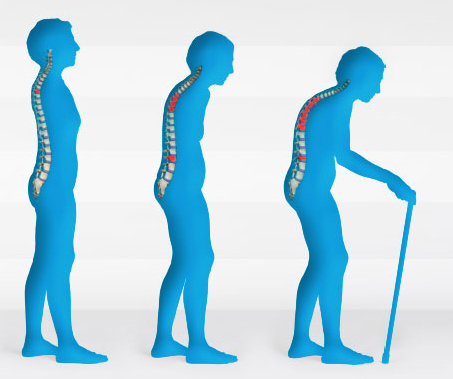 Reclast reduces the incidence of vertebral fractures by about 70% with significant reduction at one year, hip fractures by about 41%, and nonvertebral fractures by about 25% over three years. There are many side effects for bisphosphonates, such as GI problems, difficulty swallowing, inflammation of esophagus, and gastric ulcer. All these medications must be taken on an empty stomach first thing in the morning with at least 8 ounces of plain water. There are also other treatments for osteoporosis. 1. Calcitonin: the brand name is Miacalcin or Fortical. Oral salmon calcitonin is FDA approved. 2. Estrogen hormone therapy. For estrogen hormone therapy, the Women’s Health Initiative reported increased risks of myocardial infarctions, stroke, invasive breast cancer, pulmonary emboli, and deep vein phlebitis during five years of treatment with conjugated equine estrogen and medroxyprogesterone, however, subsequent analysis of those data showed no increase in cardiovascular disease, therefore, the use of the estrogen hormone treatment is recommended for only shortest duration and the lowest effective doses. All the clinicians must evaluate the risks before considering giving patient this hormonal treatment. 3. Parathyroid hormone PTH, brand name, Forteo, is approved by FDA for treatment of osteoporosis in postmenopausal women at high risk for fracture, however, there is increased incidence of osteosarcoma in rats. The usage of parathyroid hormone is cautious. adjusting the stomach and large intestine natural absorption for calcium, phosphate, magnesium, etc., to prevent mineral loss. 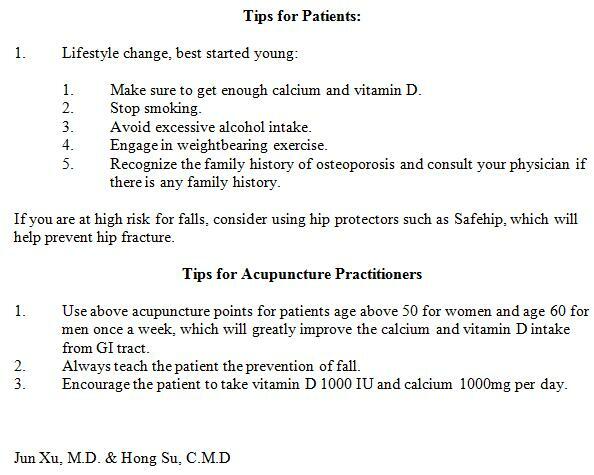 The following acupuncture points usually are selected to treat and help the prevention of osteoporosis. Dazhui Du14 and Ming Men Du4 and also Pi Shu UB20, Wei Shu UB21, Shen Shu UB23, and Qi Hai Shu UB24. 69. 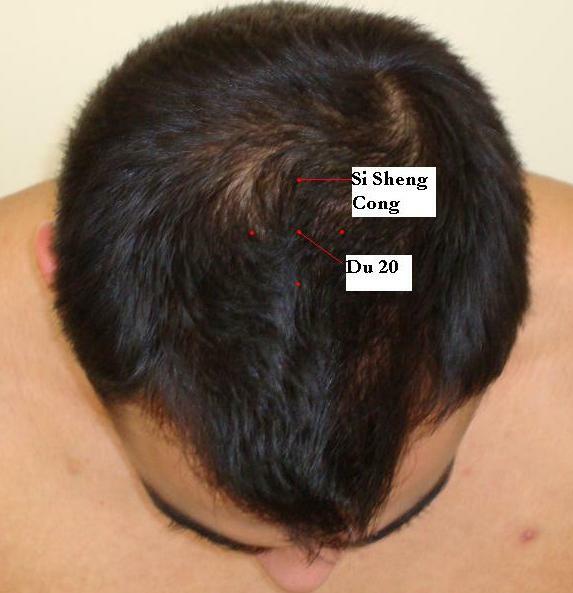 Occipital Headache, How Can Acupuncture Treat It? 66. Why did Tiger Woods receive PRP treatment for his knee and ankle pain?